Updating the Sant Ocean Hall with new models, like this giant Caribbean sea anemone sculpted by SIE, keeps the exhibitions feeling fresh. The completed 3D print is on the left. 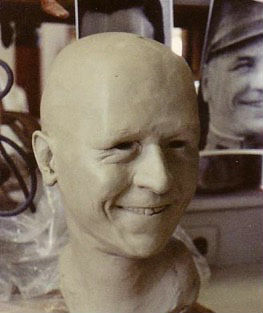 On the right, is a screenshot of the digital sculpture used to create it. A few years ago, Carolyn Thome from our 3D Studio made a signature model for the Ocean Hall’s Life in One Cubic Foot. More recently, the 3D Studio created a number of fish models to enliven the exhibition space. 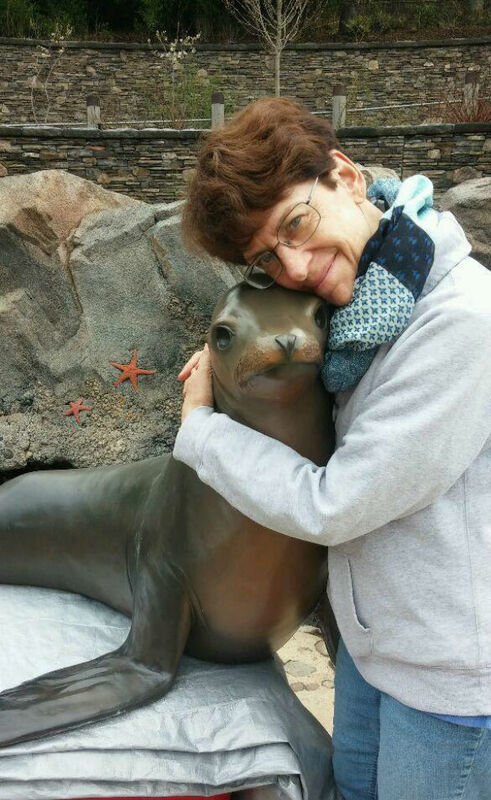 Carolyn used reference photos to sculpt the digital files to be sent to our 3D printers. This time, however, Carolyn had the opportunity to mentor an intern while she created the Ocean Hall models. 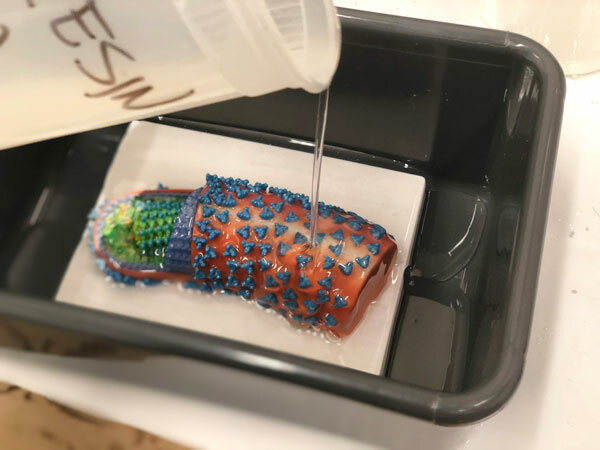 Carole Baldwin, NMNH Curator of Fishes and Chair of the Department of Vertebrate Zoology, and scientists Allen Collins and Michael Vecchione, served as the 3D Studio’s subject matter experts, ensuring the accuracy of the models. The installation of the new fish models at the Sant Ocean Hall went—wait for it—swimmingly! 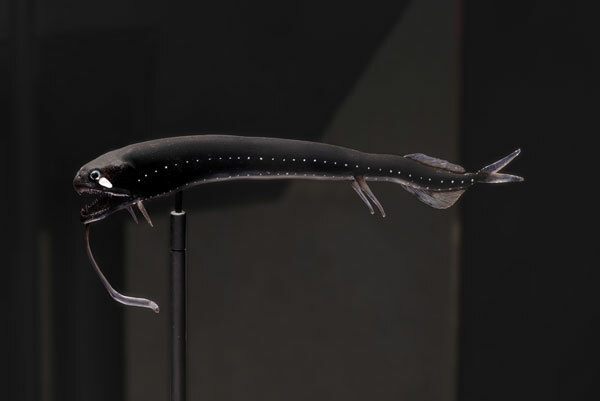 This model of a scaleless dragonfish shows off its fearsome teeth and bioluminescence. This project also coincided with the 3D Studio getting a new printer. 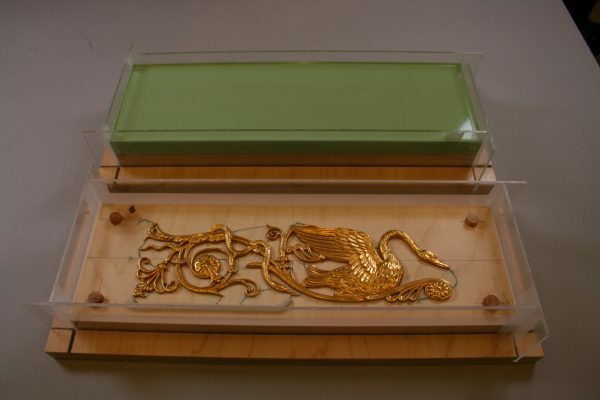 Our new SLA resin printer can produce very high resolution prints in a variety of resin types. Carolyn and our intern, Willow Collins, familiarized themselves with the new equipment. Willow also learned a new 3D modeling program—by the end of the project she was pretty much an expert in all things fish model. In fact, we were so impressed, that at the end of her internship, Willow was hired on as staff. Juvenile grey snappers appear to dart in and out of the tree roots in a mangrove forest. 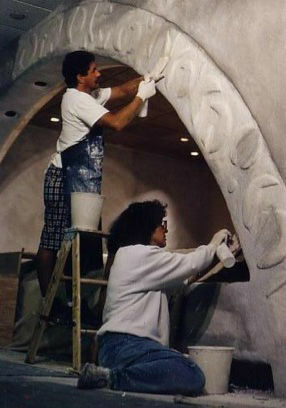 The image on the left shows the final installation. The image on the right shows the tiny fish in better detail. 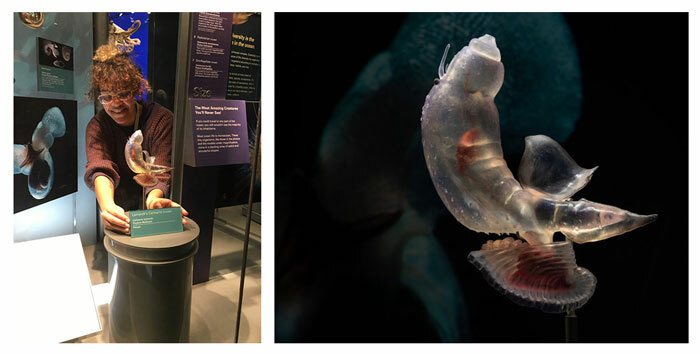 Exhibit specialist and 3D model maker Willow Collins installs one of her creations, a translucent Lamarck’s Carinaria sea snail. The position of the model on the mount, which nearly disappears once the installation is complete, shows how this type of sea snail floats through the water. 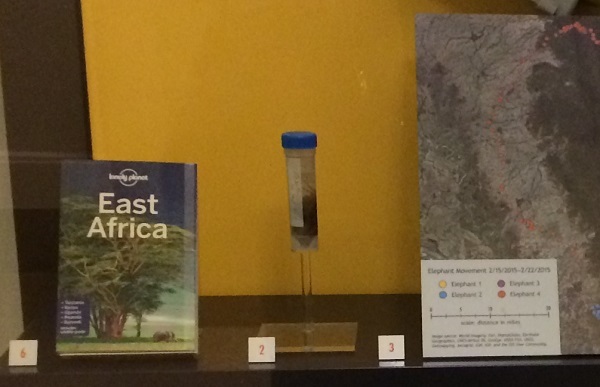 Both exhibits feature books from Smithsonian Libraries’ collections, but they deal with very different subjects. 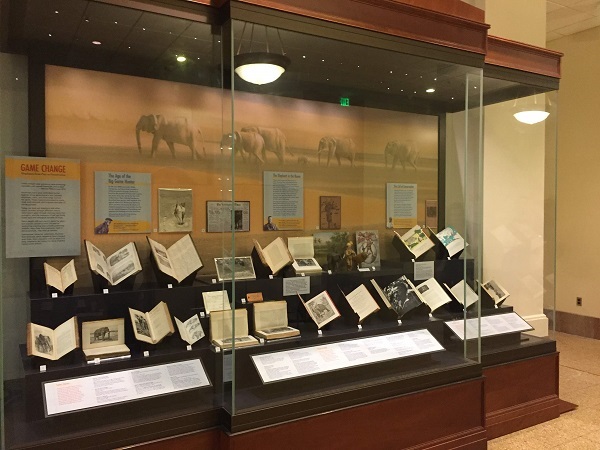 Game Change traces the shift in public attitudes about elephants from the late 19th century, an era when big game hunting was popular, to the critical conservation concerns of today. 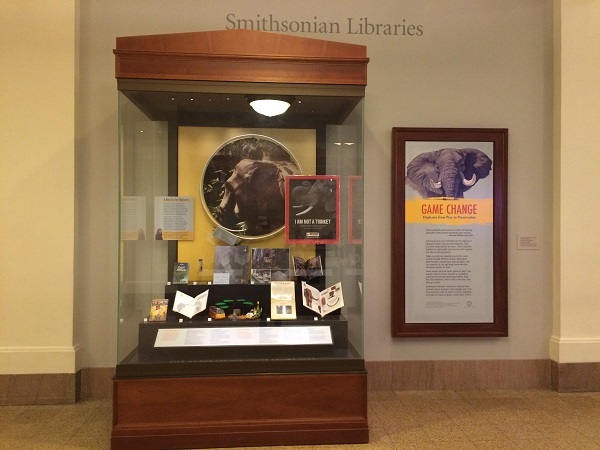 Game Change: Elephants from Prey to Preservation was curated by Cheryl Braunstein, Manager of Exhibit Planning and Development at the Smithsonian’s National Zoo and Conservation Biology Institute. It’s on display on the Ground Floor of the National Museum of Natural History through February 1, 2020. 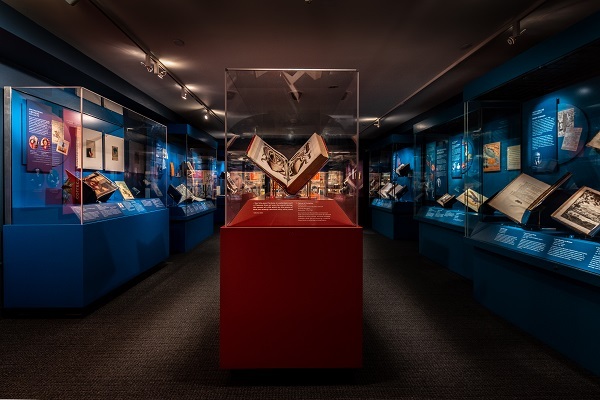 Magnificent Obsessions focuses on the pioneering collectors who shaped Smithsonian Libraries’ diverse collections in the areas of science, technology, history, art, and culture. 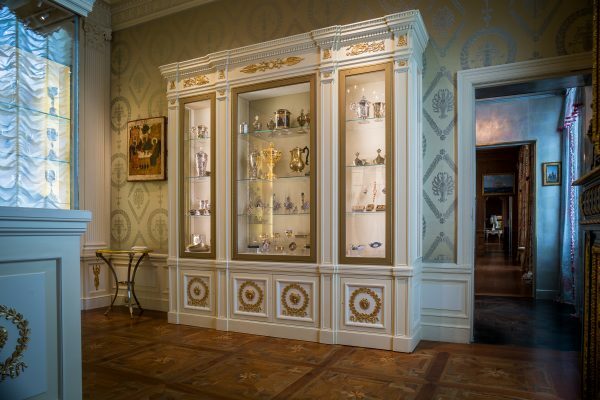 Magnificent Obsessions: Why We Collect was curated by Stephen Van Dyk, Head of the Art Division at Smithsonian Libraries and Mary Augusta Thomas, Deputy Director of Smithsonian Libraries. 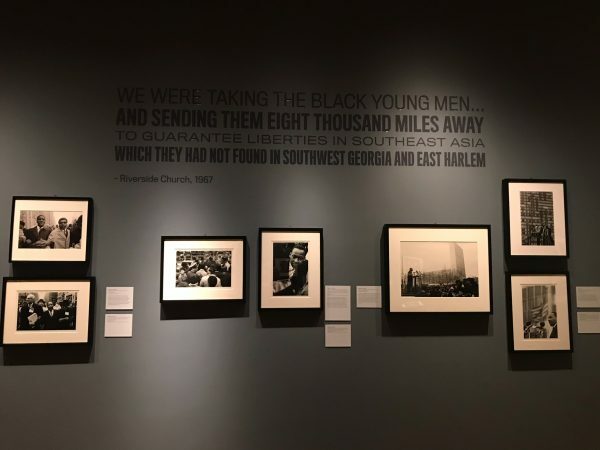 It’s on display on the 1st Floor, West of the National Museum of American History through July 1, 2020. 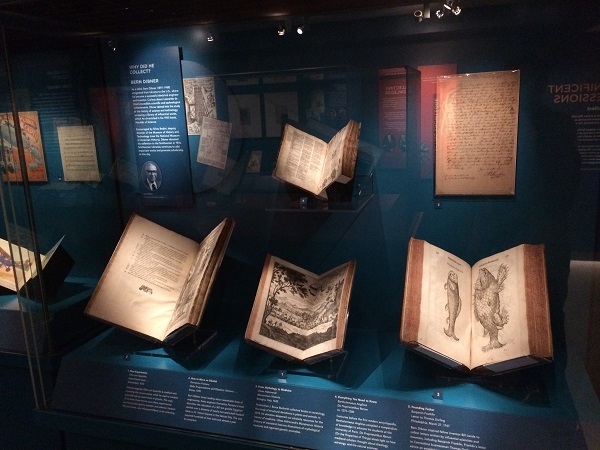 The books and artifacts featured in the exhibits show the incredible diversity of the Smithsonian’s collections. 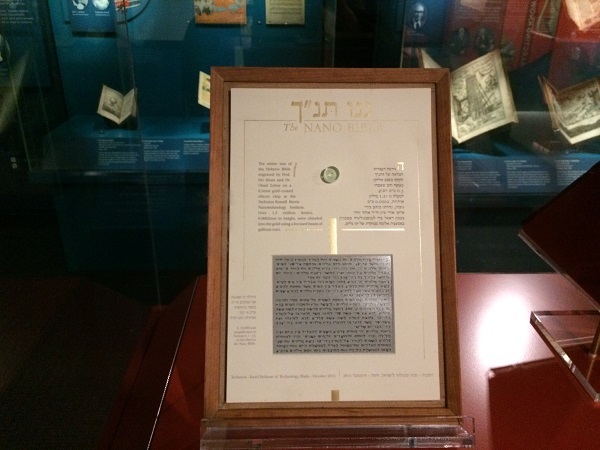 The smallest artifact displayed in Magnificent Obsessions is the “Nano Bible,” a microscopic version of the Hebrew Bible engraved on a microchip the size of a grain of sugar. 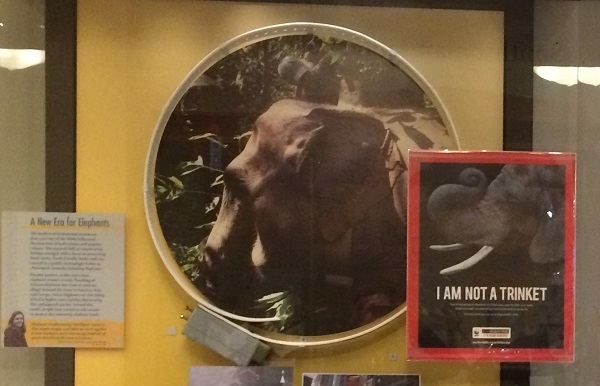 The largest artifact displayed in Game Change is a radio collar used to track elephants in the wild. The oldest artifact displayed in Magnificent Obsessions is a handwritten forerunner of the encyclopedia (at top center) created in the 13th century, before the advent of the printing press. Of course, these exhibits are about more than just objects. The exhibit development team (including yours truly) wanted to go beyond the books to highlight the human stories they tell. 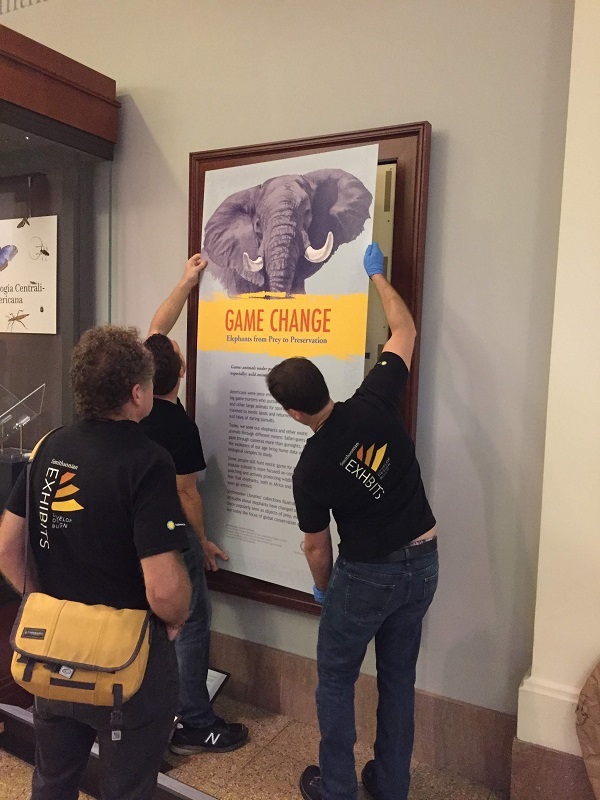 Game Change uses books and artifacts to show how humans’ attitudes about elephants have changed over time. 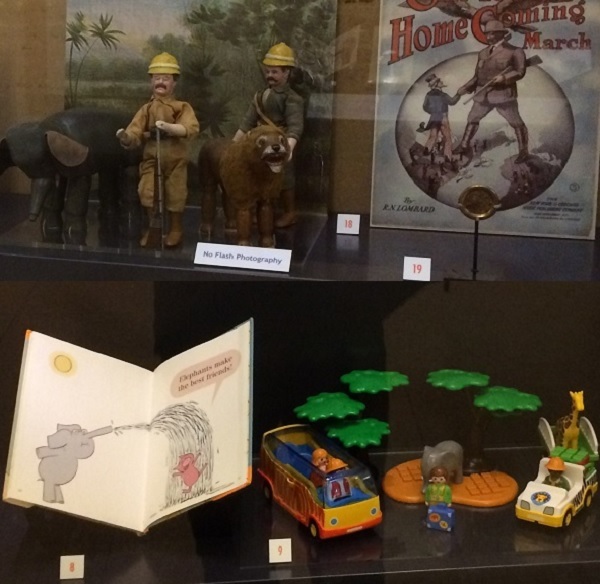 Contrasting books and artifacts, including children’s books and playthings, demonstrate the shift in attitudes about elephants from the early 20th century (top) to today (bottom). 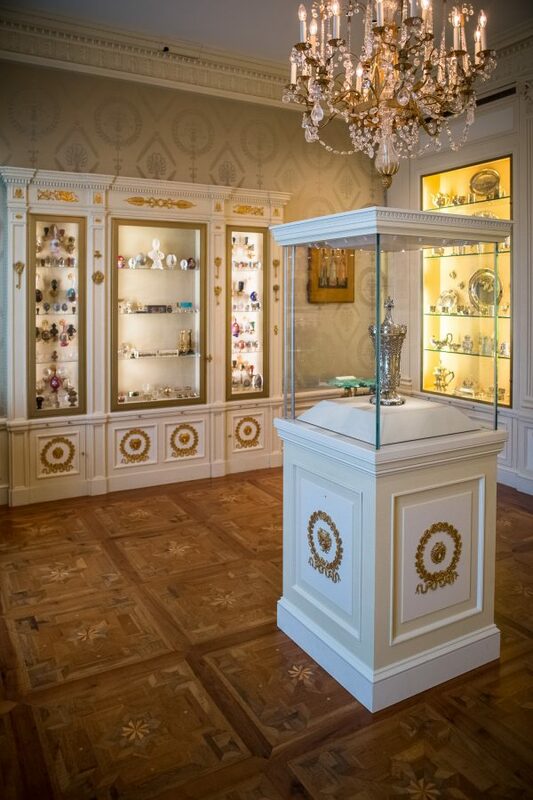 Magnificent Obsessions reveals the extraordinary passion collectors have for their subjects and explores what motivates them to collect. Profiles of curious collectors explain what drove them to collect. We also wanted to open the conversation up to visitors by asking what they collect and why. SIE’s design team included Elena Saxton on Game Change and Elena and Madeline Wan on Magnificent Obsessions. Elena and Madeline helped bring the stories to life with engaging designs and eye-catching graphics. The graphic design for Game Change features illustrations taken from the books displayed. The designers used vibrant colors in Magnificent Obsessions to make the exhibit pop and help visitors navigate the different sections. At the entrance to Magnificent Obsessions, the team created lenticular graphics, which change as you walk past them. These add movement and reveal the faces of the collectors behind the collections. Look out for a future blog post explaining how these were made. The lenticular graphics at the entrance to Magnificent Obsessions help draw visitors into the space. SIE’s graphics team, including Evan Keeling, Mike Reed, and Scott Schmidt, printed and installed the graphics for both exhibits. Scott inspects graphics for Magnificent Obsessions. SIE’s graphics team installs a panel in Game Change. 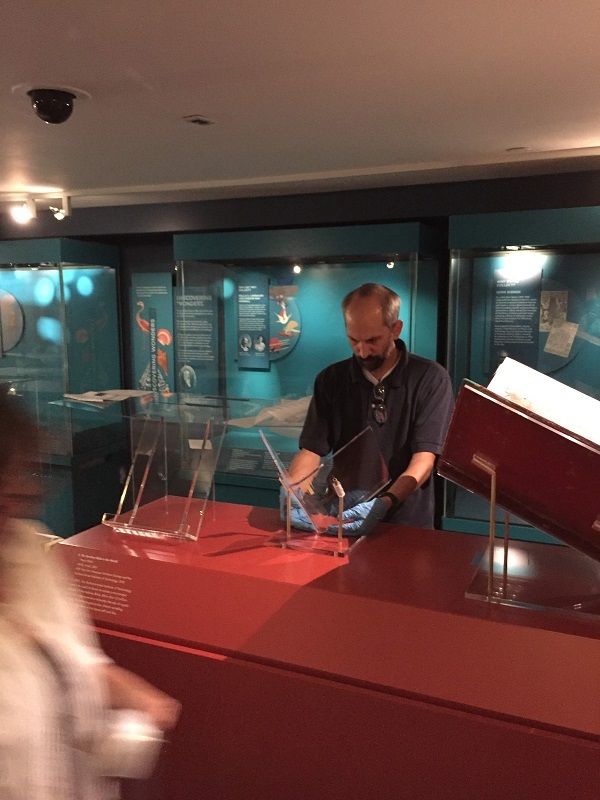 SIE’s 3D studio team members Chris Hollshwander and Danny Fielding worked with Vanessa Haight Smith, Head of Smithsonian Libraries Preservation Services, to make and install the mounts for the books and artifacts displayed in the exhibits. Chris installs a cradle mount to support one of the many books in Magnificent Obsessions. 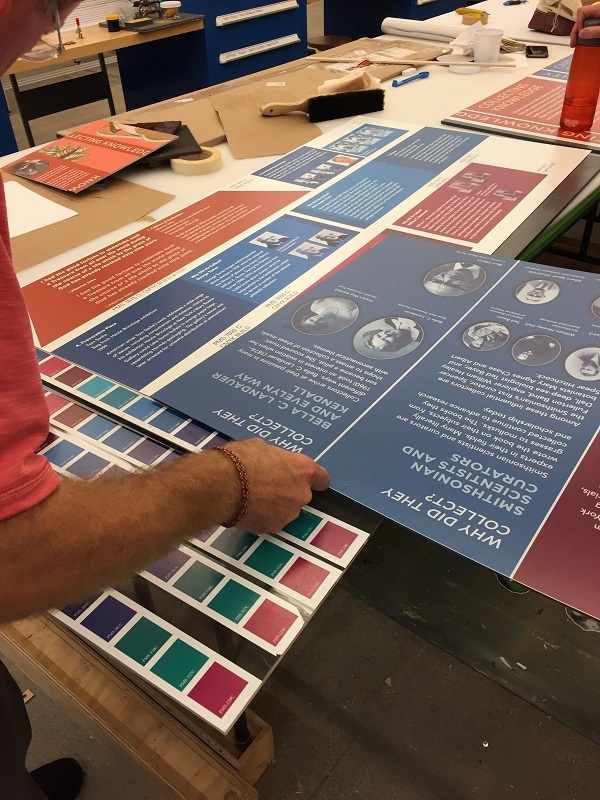 Throughout it all, Smithsonian Libraries Exhibitions Program Coordinator Kirsten van der Veen and SIE Project Manager Betsy Robinson kept the team on track and on schedule—no easy feat, since the exhibits opened within weeks of each other! Both exhibits are on display now. Please stop by and let us know what you think. In the meantime, we look forward to the next chapter of our collaboration with Smithsonian Libraries! Working on a museum about an agency that produces, analyzes, and disseminates military intelligence information creates some interesting workflow protocols. 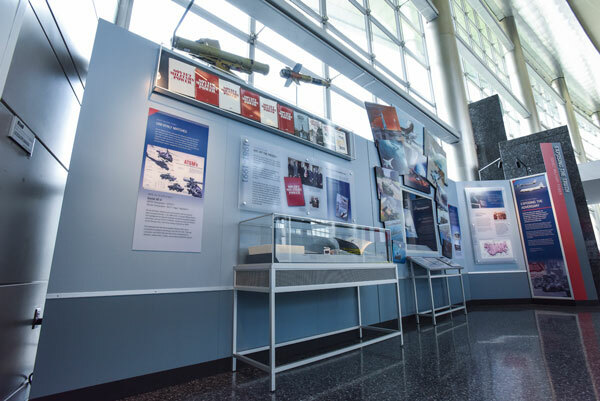 When SIE began working with the Defense Intelligence Agency (DIA) on Mission: DIA, we knew that we’d have to build a museum from scratch because their atrium didn’t have an existing museum space. 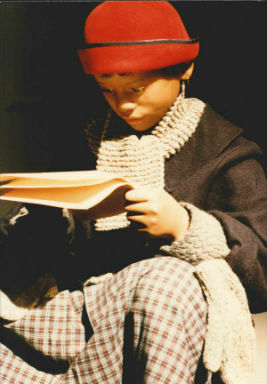 We knew that we’d work with their historians and other experts to create a museum script that told complicated stories. We knew that the graphics would have to convey complex information. And we knew that there was a lot we didn’t know, weren’t allowed to know, and probably won’t ever get to know. Our unconventional workflow more or less went as follows. First topics were brainstormed, then discussion would follow. 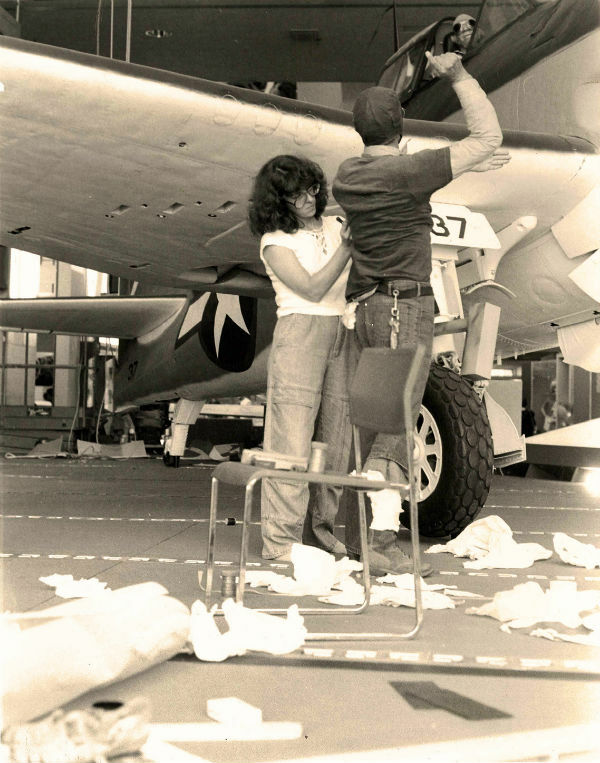 As ideas were suggested and settled on, the DIA historians would determine the exact story they wanted to use, and then go off to confirm that the details needed to tell the story well were cleared for use or could be cleared quickly. And lest you think that SIE got to go through all the super-secret stuff, everything had to be declassified before it came to our office, too. Mission: DIA opened its first phase in the summer, and more phases are underway. After vetting, scrubbing, redacting, and whatever else might be required, the photos from the first phase’s opening were released to us. So now, unlike the exhibition’s source material, I can talk about the first phase of the project. The Mission: DIA project posed a number of challenges, not unlike REDACTEDREDACTEDREDACTED REDACTED REDACTEDREDACTEDREDACTEDREDACTEDREDACTEDREDACTEDREDACTED. One challenge was that there was no existing museum and the exhibition was to be built inside a large open space. This meant the designer had to create a “room within a room” in order for there to even be an exhibition. 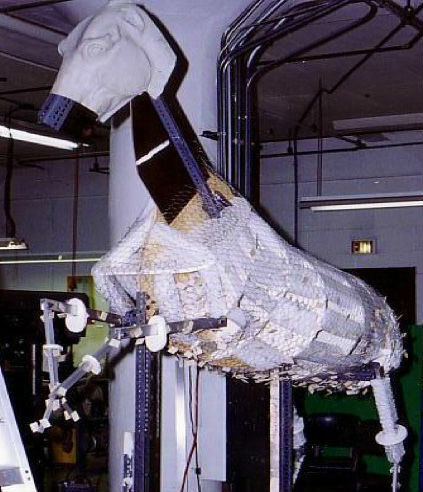 This overhead view shows off the design, SIE’s fabrication, and the cast figures made by SIE’s 3D Studio. The two people in the foreground are actual people. The “people” in the back corner behind the reader rail are cast figures. The first section to open, Exposing the Truth, explores DIA’s role in bringing unseen threats to light. The exhibition delves into the escalation of Soviet weapons programs during the Cold War, the Cuban Missile Crisis, catching a spy within the agency, and the H1N1 flu pandemic. DIA’s publication, Soviet Military Power, was an unclassified document meant for the general public. It showed readers specific threats from the Soviet Union. Here, some of the weapons the publication highlighted are displayed with copies of Soviet Military Power’s ten editions. The mission of DIA’s National Center for Medical Intelligence (NCMI) is to predict medical threats and prevent potential infectious outbreaks from impacting the U.S. military and its global allies. As excited as we are to have the first section open, we look forward to continuing our work on the rest of the museum. The museum REDACTEDREDACTEDREDACTEDREDACTEDREDACTED REDACTED REDACTED REDACTED REDACTEDREDACTEDREDACTED REDACTED REDACTED REDACTEDREDACTED REDACTEDREDACTED is REDACTED REDACTEDREDACTED open REDACTEDREDACTED. It REDACTED REDACTED REDACTEDREDACTED REDACTED REDACTEDREDACTEDREDACTED REDACTED REDACTED went REDACTEDREDACTEDREDACTED REDACTEDREDACTED REDACTEDREDACTED REDACTED REDACTED REDACTEDREDACTEDREDACTED REDACTEDREDACTEDREDACTEDREDACTED REDACTEDREDACTEDREDACTEDREDACTED REDACTEDREDACTEDREDACTED REDACTED REDACTEDREDACTED REDACTEDREDACTEDREDACTED REDACTEDREDACTED REDACTEDREDACTEDREDACTEDREDACTED REDACTEDREDACTED REDACTEDREDACTED well REDACTEDREDACTED REDACTED REDACTEDREDACTEDREDACTEDREDACTEDREDACTEDREDACTED REDACTED REDACTED REDACTEDREDACTED REDACTEDREDACTED REDACTEDREDACTEDREDACTED REDACTED REDACTEDREDACTED REDACTED REDACTED REDACTEDREDACTEDREDACTEDREDACTED REDACTEDREDACTED REDACTEDREDACTEDREDACTED REDACTEDREDACTEDREDACTED REDACTEDREDACTEDREDACTED REDACTEDREDACTEDREDACTED! When people ask me what inspired me to pursue a degree in Arts Management at the University of Massachusetts Amherst and an internship at Smithsonian Exhibits, my thoughts turn to my grandfather, Benedict J. Fernandez. A dyslexic Italian-Puerto Rican man from Harlem with no degree or a stable family to lean on while growing up, my grandfather became an icon of the arts and an inspiration to individuals around the globe, all because of his persistence. 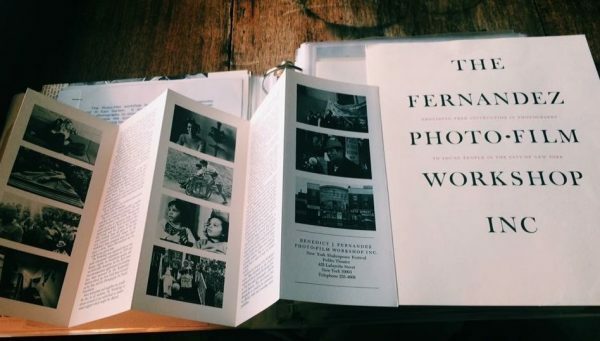 As one of New York City’s leading arts educators, photographers, and photojournalists throughout the 1960s, ’70s, and ’80s, he transformed the ways in which photography was appreciated, practiced, and taught. As a young girl, I was incredibly intrigued by the work that my grandfather produced throughout his career. As the years have gone on, I have grown more and more fascinated with preserving the history behind the craft that he so effortlessly perfected. To say I am grateful and inspired would be a massive understatement. ‘I Am a Man’ Sanitation Workers Strike. 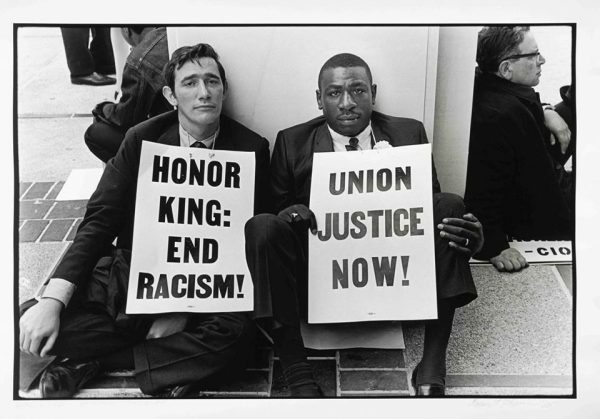 Memphis, Tennessee 1968 © Benedict J. Fernandez. All rights reserved. 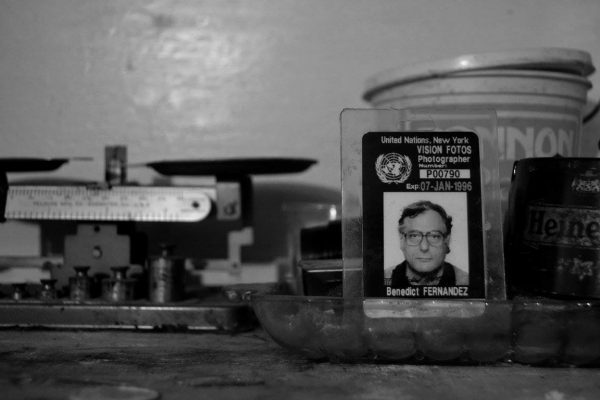 Benedict J. Fernandez’s Photo-Film Workshops taught photography to young people from underprivileged backgrounds around the world for more than a decade. I have spent countless hours with my grandparents, looking through books, contact sheets, and boxes of prints, admiring the thousands of mainly black-and-white photographs that my grandfather created, including collections featured in the Smithsonian’s National Portrait Gallery and National Museum of African American History and Culture, among many other renowned museums. Each visit with my grandparents, I learn more and more of the stories behind every photograph. It is fascinating to hear them reminisce about the times, people, and places that encompass each photo. Working with my grandparents is truly awe-inspiring. 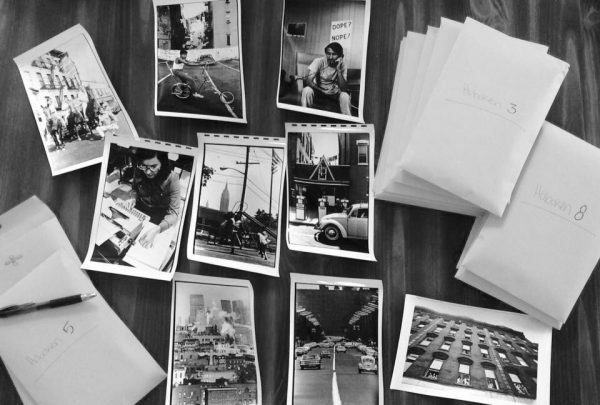 Alongside the images and stories are thousands of personal letters and documents that chronicle my grandfather’s remarkable career. As I entered my adult years, I knew that I had to document all of the iconic history that my grandparents were passing on to me. Listening, admiring, and recording the countless stories and memories has consumed much of my time with my grandparents today. 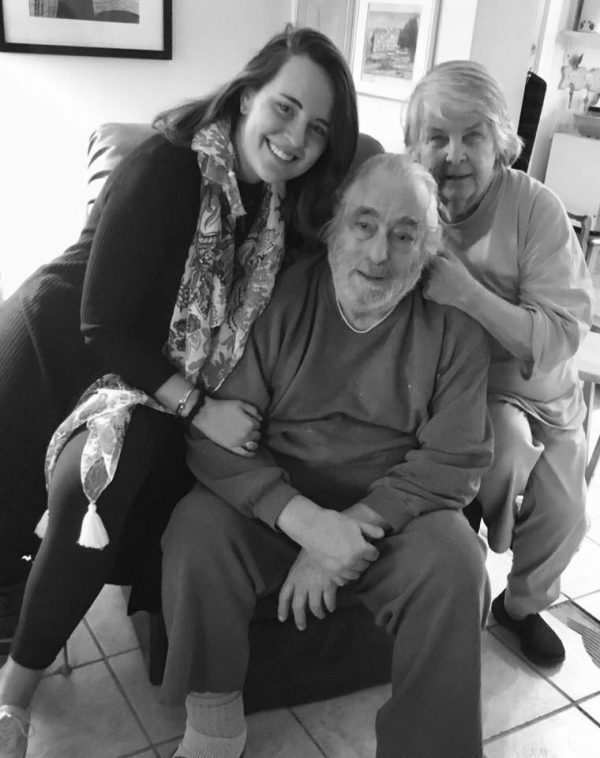 Learning from and working with my grandparents—who have encouraged and taught me more than I can put into words—has truly given me insight into the path that I hope my career will follow. My grandfather’s darkroom is a blast from the past. When I was offered the opportunity to intern at Smithsonian Exhibits, I felt as if I were dreaming. Finally, this was my chance to follow in my grandparents’ footsteps and begin my own momentous career. As the largest museum, education, and research complex in the world, the Smithsonian is a wonderland for the arts, history, and science. After discussing the opportunity, my grandparents encouraged me to accept the offer and explore this next path. My first visit to the National Mall in 2017 initially inspired me to apply for an internship at the Smithsonian. Before that, the Smithsonian was somewhere I could only dream of working. I am incredibly thankful to have had the chance to intern with Smithsonian Exhibits and the Smithsonian Institution as a whole. 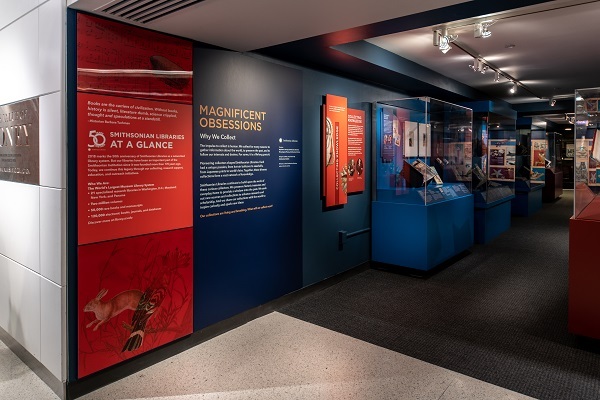 During my time with Smithsonian Exhibits, I have gained a greater understanding of the operations that go into exhibition design at museums, galleries, and other cultural spaces. I have learned about curatorial work and the thought processes that go into presenting exhibitions to the public, both in person and online. 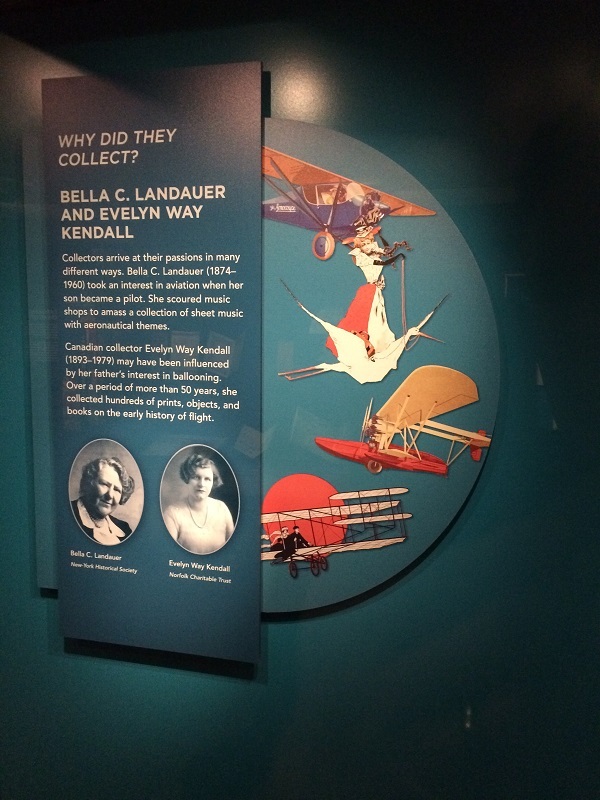 I have learned about the behind-the-scenes work that goes into creating new exhibits, both large and small. I have been able to better understand the project management processes, the design processes, the fabrication processes, and so much more. Armed with this knowledge, I will head back to Massachusetts with a whole new set of expertise that will help me to fulfill both my academic and career goals moving forward. Thanks to Smithsonian Exhibits and my grandparents’ extraordinary motivation, as I enter the next chapter of my life, it has become clear to me that educating others, igniting imagination, and inspiring creativity is the path I must follow on my quest to keep my grandfather’s iconic work and legacy eternally alive. 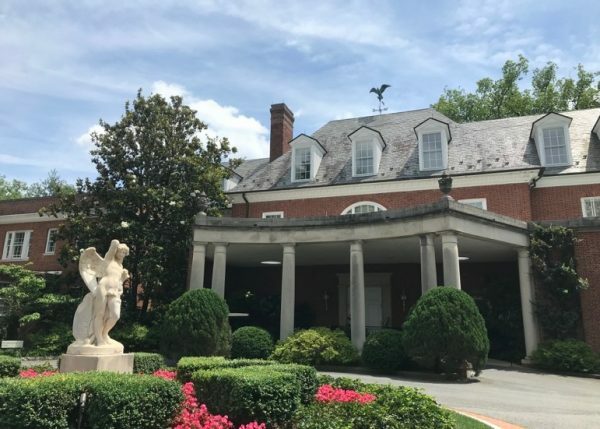 In 1955, businesswoman, philanthropist, and collector Marjorie Merriweather Post (1887–1973) purchased the Hillwood Estate in Northwest Washington, D.C. Post directed her architects and designers to refurbish the 1920s neo-Georgian mansion into a nobler residence that would function as a fully staffed home as well as a showcase for her sophisticated collections of late eighteenth-century French and Imperial Russian décor. 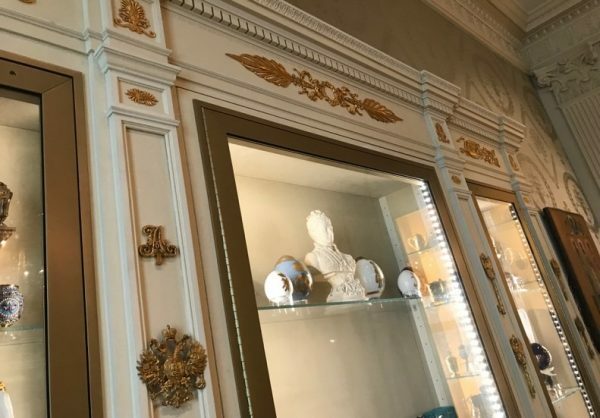 Today, visitors from around the world can experience the Hillwood Estate and explore the awe-inspiring mansion, museum, and thirteen acres of formal gardens that continue to display Marjorie Merriweather Post’s charming array of collections: a tasteful and true legacy that she left behind. 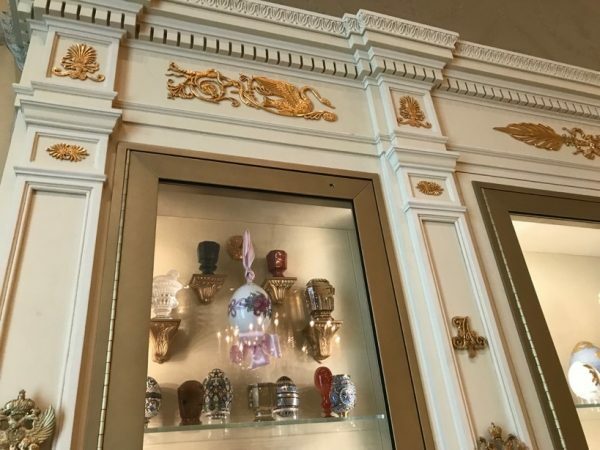 When the Hillwood Estate, Museum, and Gardens approached Smithsonian Exhibits (SIE) to recreate a number of decorative elements for a newly constructed display case, we jumped at the challenge. 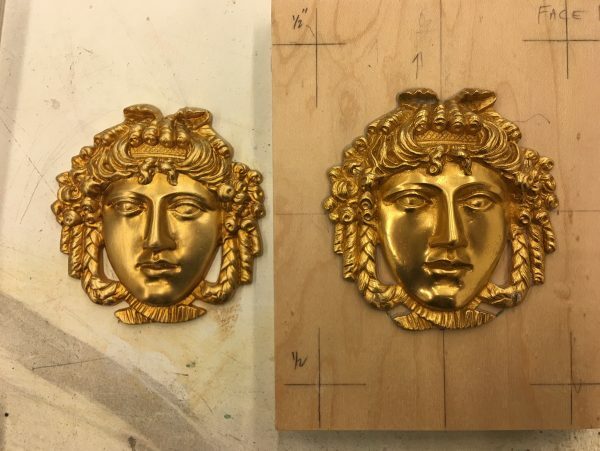 The sign of a good replica is that you can’t tell the difference from the original. 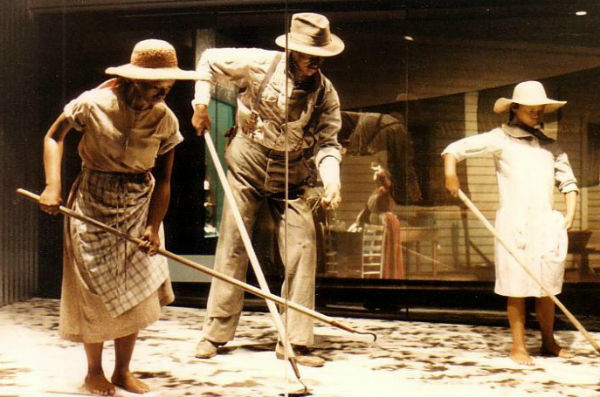 At Smithsonian Exhibits, that is exactly what the sculptors and model makers aim to achieve. Project Manager Seth Waite and Exhibits Specialists Danny Fielding, Chris Hollshwander, and Carolyn Thome worked on the project for SIE. 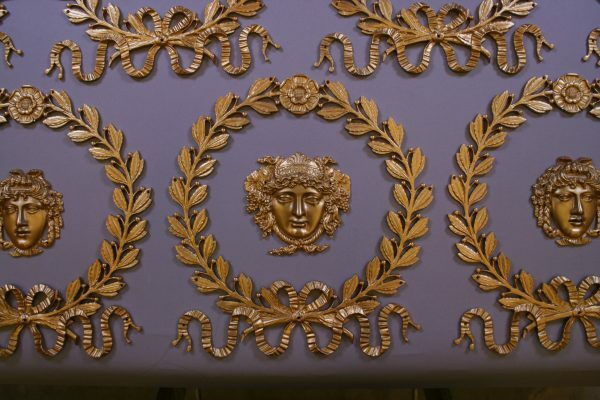 After doing some research, Seth discovered that the hardware company and metal foundry that made the original decorative elements—P.E. Guerin, established in New York in 1857—was still in business. Hillwood considered working with the company to recreate the elements using their traditional metal casting techniques, but ultimately decided to go with SIE’s traditional approach using more modern materials. On any project, the first step is to determine the client’s needs and decide which methods and approaches will work best to meet them. 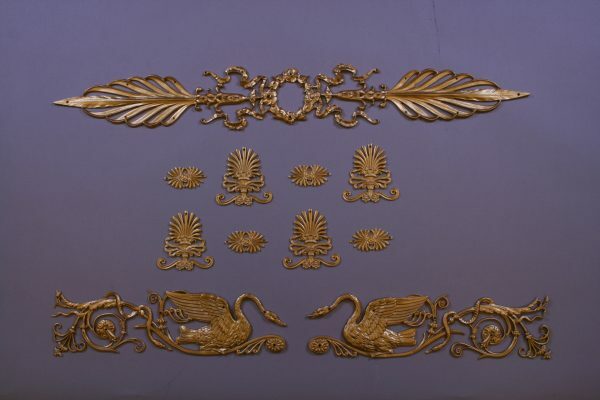 When recreating the decorative elements for Hillwood, SIE carefully considered a variety of manufacturing methods, eventually deciding that Danny would mold and cast the pieces himself. 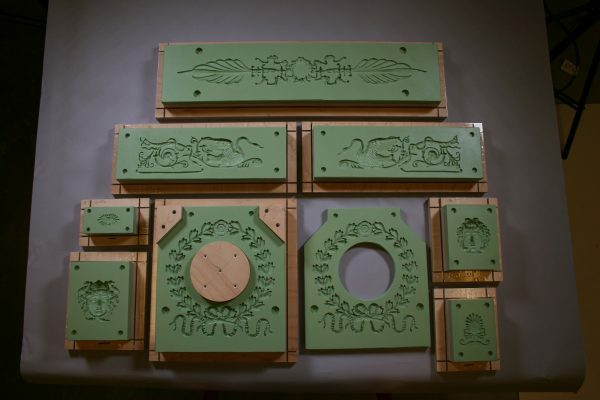 Once this decision was made, the next step was to select the best materials to use to create the most faithful and durable replicas for Hillwood. After testing the compatibility of several materials and carefully preparing the molds, SIE’s experts then proceeded with production. 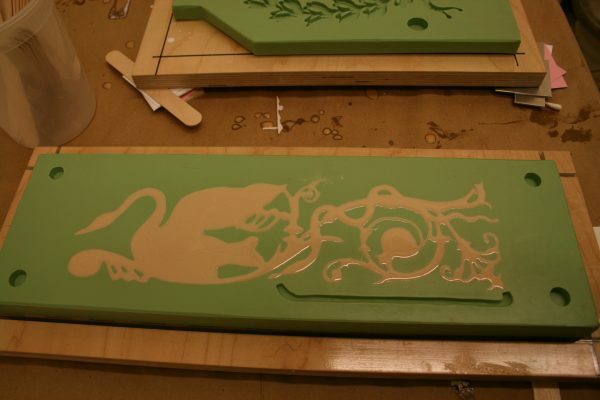 Resin is poured into one of the molds to create a cast. 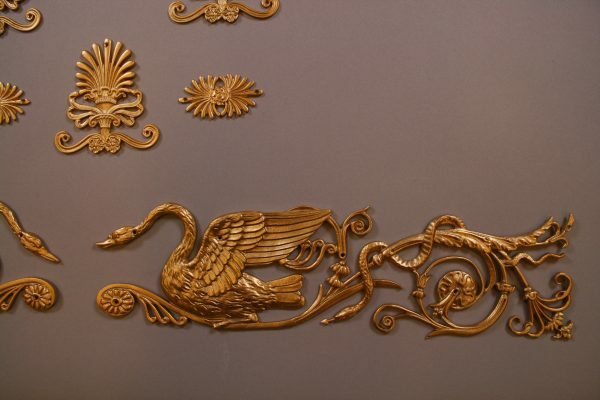 Finally, Carolyn created a finish that closely matched the originals. While this only skims the surface, hopefully it gives you a better idea of the multifaceted steps that go into replicating artifacts. The next time that you’re admiring a work of art—original or a replica—take a moment to study the craftsmanship of the piece. 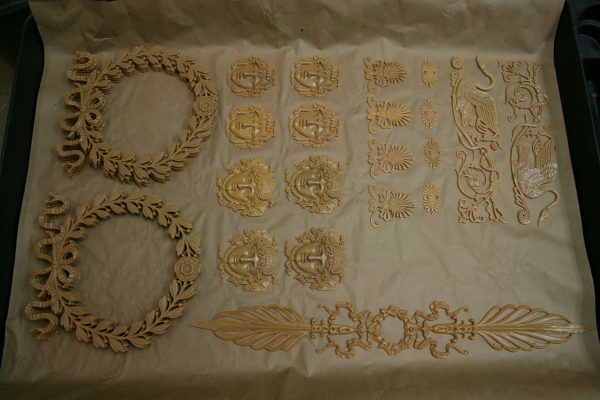 The artistry and attention to detail that go into the process is truly awe-inspiring. An interconnected world allows for the easy transmission of ideas, commerce, scientific discoveries, and so many other things … like communicable diseases. 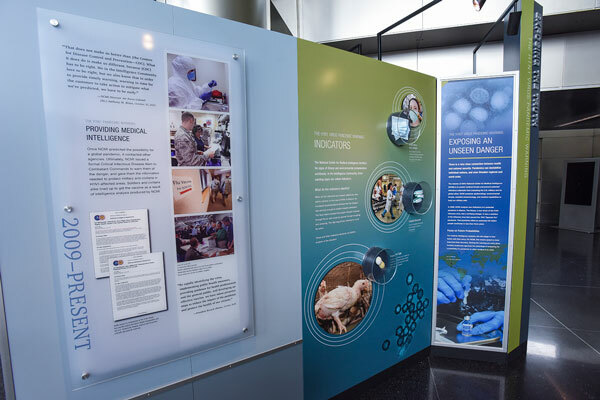 The National Museum of Natural History’s new exhibition, Outbreak: Epidemics in a Connected World, explores how microscopic pathogens can cause widespread disease outbreaks. When outbreaks occur, epidemiologists, veterinarians, public health workers, and others all work to identify and contain the infection. These pathogens wreak havoc in communities—not just affecting health, but also leaving huge social and emotional impacts. Worst class picture ever. Back row: Malaria, e. Coli, Lyme Disease. Front row: Ebola, Zika, HIV, and influenza. And therein lies the tricky part for the exhibition: the impacts are huge, but the pathogens are too small to be seen by the naked eye. Exhibitions are by definition a three-dimensional, visual experience. 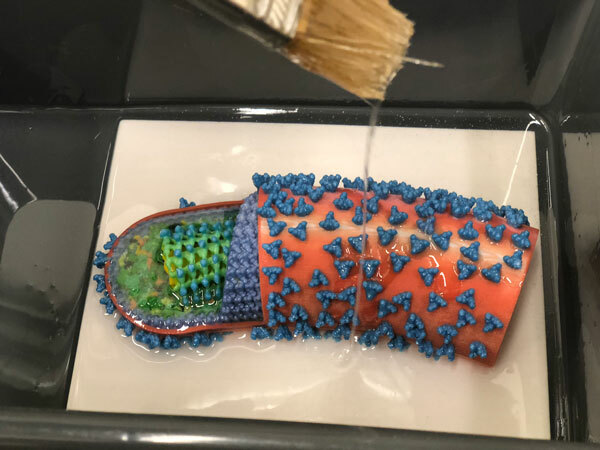 In order to give the pathogens more prominence, the National Museum of Natural History opted for 3D prints of the microbes at scales that, well, honestly are kind of terrifying when you consider what these pathogens do. 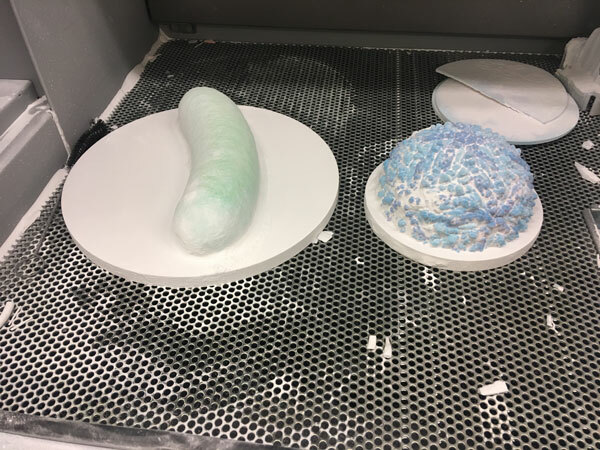 Our model maker Carolyn Thome and National Museum of Natural History designer Julia Louie used 3D pathogen files downloaded from the National Institute of Health’s 3D print exchange. (The downloads are free and are handy tools for educators, medical professionals, scientists, and others.) Carolyn manipulated the files to digitally cut the models in half and place them on bases she created using CAD software. 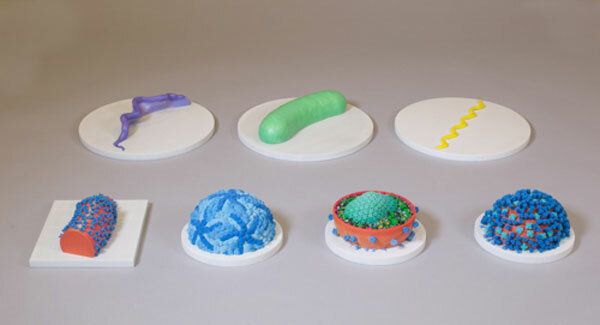 Color prints of e. Coli and influenza coming out the 3D printer. She printed her models in color, rather than painting them. It wasn’t necessary to have a true-to-life paint job because the pathogens’ colors aren’t based on their innate colors, but rather are applied to make it easier for visitors to understand their shapes. 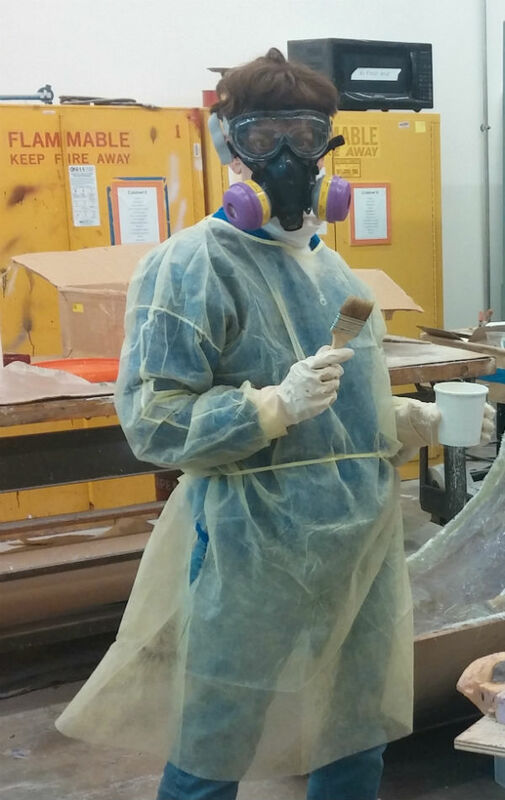 Ebola gets a resin bath. The finished models needed an epoxy infiltration to give them stability and an even sheen. 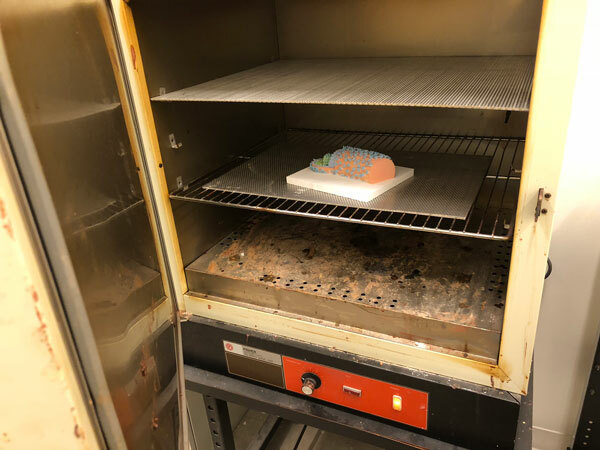 The heat and resin work together to create a chemical reaction that makes a sturdy finished product, but because of the viscosity and quick setting time, Carolyn only had approximately twenty minutes to finish each resin coating. Ebola goes back into the vacuum chamber. 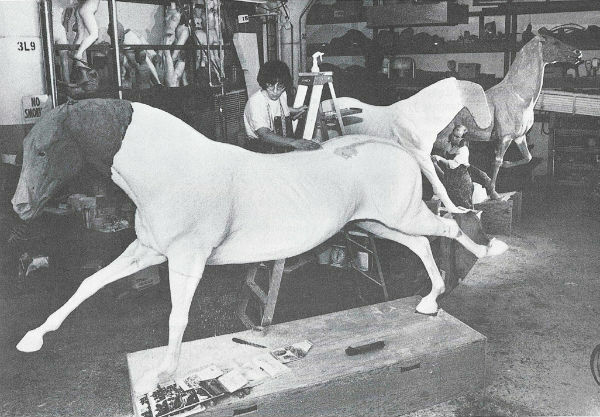 If a model needed a second coat of resin, Carolyn needed to place it in a vacuum chamber and then repeat the speedy process. And one more coat of resin for Ebola. Outbreak will be featured on the second floor of the National Museum of Natural History for roughly three years before it’s contained in 2021. It’s almost summer vacation! The time when students and teachers get to reminisce about all the fun things that happened throughout the year. Well, we’re doing the same thing. This year, Smithsonian Exhibits had the pleasure of hosting a fifth-grade field trip. Ms. Deaton’s class, from Stratford Landing Elementary in nearby Fairfax County, Virginia, had a class project to create an exhibition. What better place to learn about the exhibit process than a place that can take a project from development through design and all the way into fabrication and installation? Students had a chance to talk with staff and learn more about exhibit development. They also got a tour of our 3D studio, fabrication shop, and graphics production. Later on, Ms. Deaton let us know that we helped them with their project … and also inspired them to take on another project. So, what was this fun new project these multi-tasking kids took on? Comic books. Evan Keeling, one of our graphic specialists, showed the students how to make mini-comics like the ones he’s created for the National Museum of American History, the National Portrait Gallery, the National Museum of the American Indian, and other Smithsonian groups. The Comic Library. One of Evan’s comics is on the left, his future competitor’s is on the right. 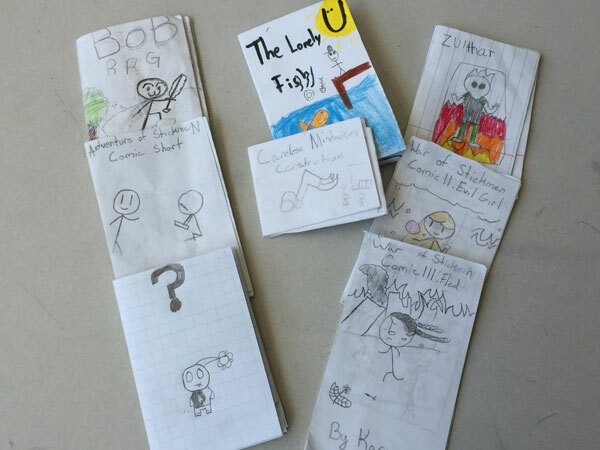 Ms. Deaton’s students ran with the mini-comic idea. 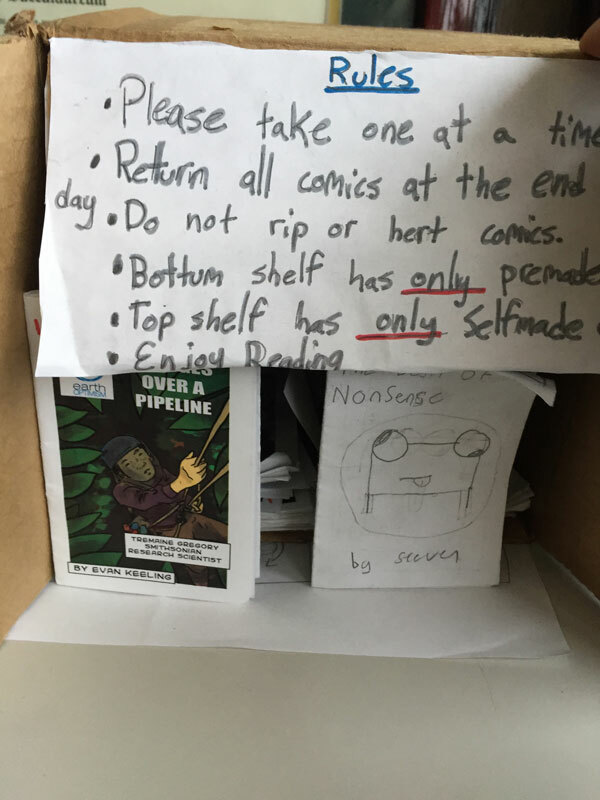 Soon, the students opened a comic library at their school. Students can make their own eight-page booklet, add it to the library, and other students can check them out. A selection of comics I plan on checking out of Ms. Deaton’s classroom if she lets me get a comic library card, too. After a long winter, it looks like spring is finally here. What better way to celebrate than by visiting Smithsonian Gardens? Smithsonian Gardens creates and manages the Smithsonian’s outdoor gardens, interiorscapes, and horticulture-related collections and exhibits. 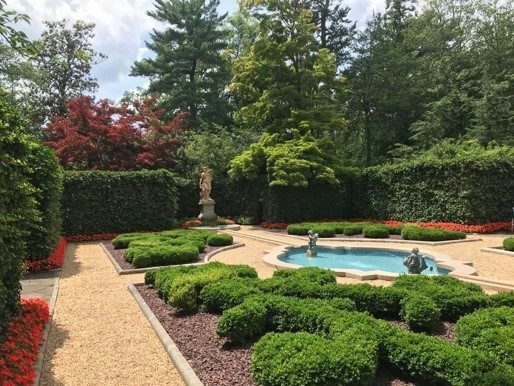 It is a “museum without walls” and one of the few gardens to be accredited by the American Alliance of Museums (AAM). Smithsonian Gardens oversees more than a dozen gardens. 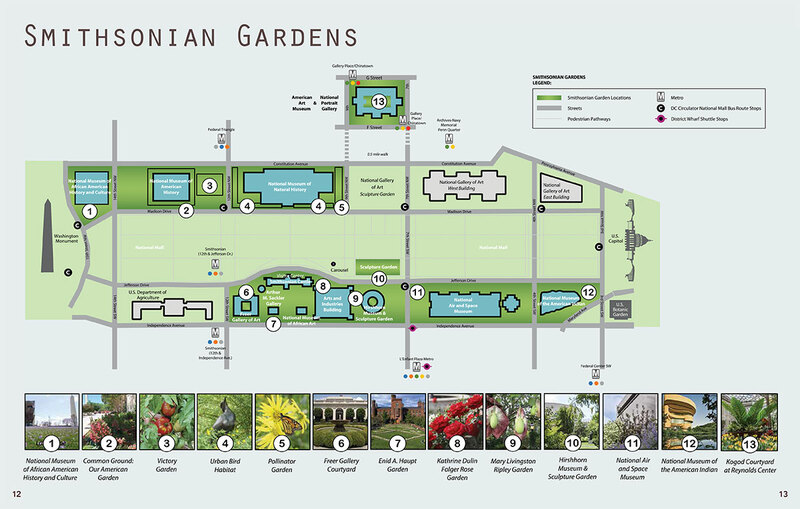 Recently, Smithsonian Exhibits worked with Smithsonian Gardens to develop an interpretive master plan for their new exhibition series, which will tie together all of their gardens with a single theme. The theme for 2019–2020 is Habitat. An interpretive master plan identifies the exhibition’s stakeholders and target audiences, outlines key goals and objectives, establishes an interpretive hierarchy, and provides a road map forward for launching a new exhibition. 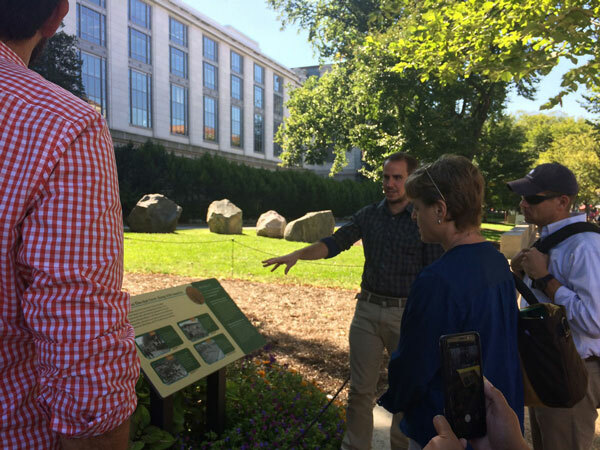 This was truly a grassroots effort, involving the entire Smithsonian Gardens staff, including educators, horticulturists, and landscape architects. 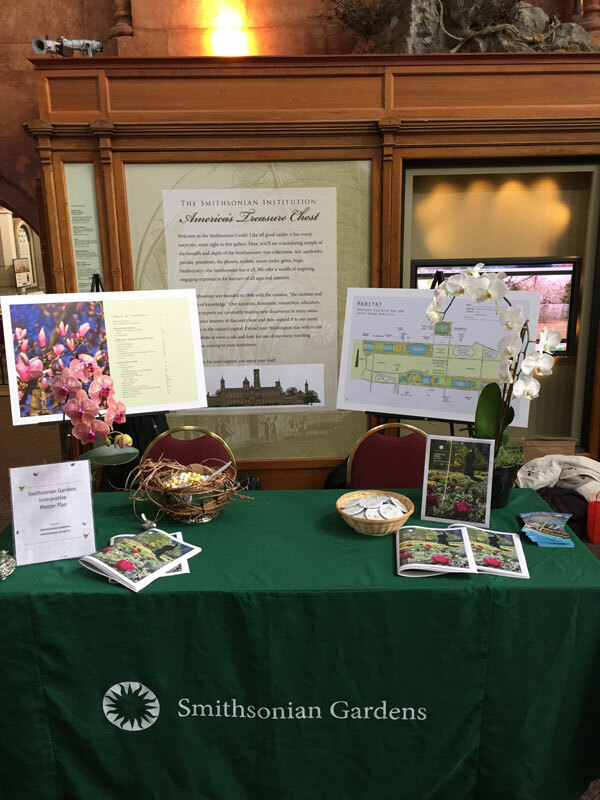 Staff members were invited to come up with proposals for exhibits, which were included in the final interpretive master plan. 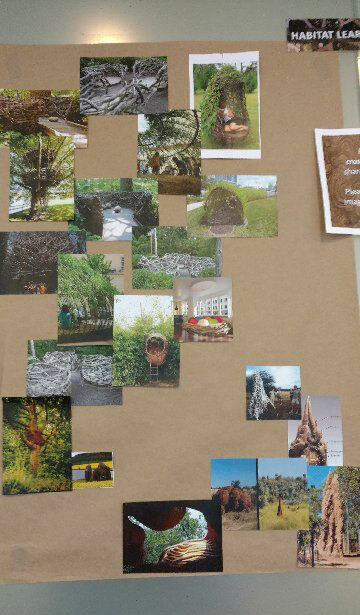 Images collected by Smithsonian Gardens’ staff provided inspiration for the individual exhibits. 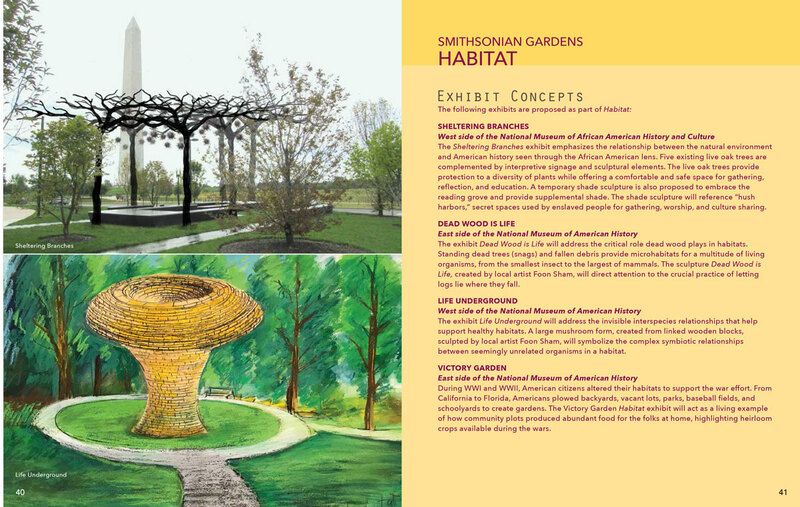 Exhibit concepts include sculptural elements and other structures that mimic natural habitats. Horticulturist James Gagliardi leads SIE’s team on a tour of the gardens. As part of the project, SIE’s senior exhibit graphic designer Madeline Wan worked with Smithsonian Gardens to develop a logo for the Habitat exhibition that evoked the idea of habitats as homes. The Habitat logo will appear on all of the exhibition’s materials. 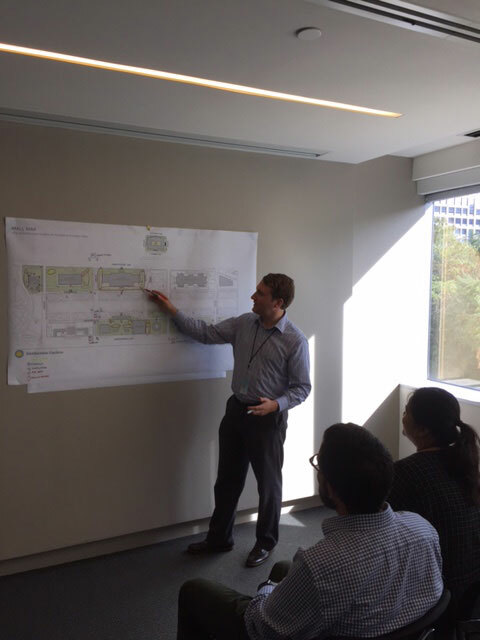 SIE exhibit developer/writer John Powell (yours truly) reviews a map of the proposed exhibits with the IMP team. One of the most exciting parts of Smithsonian Gardens’ exhibition series is that it connects and unifies many different parts of the Smithsonian. 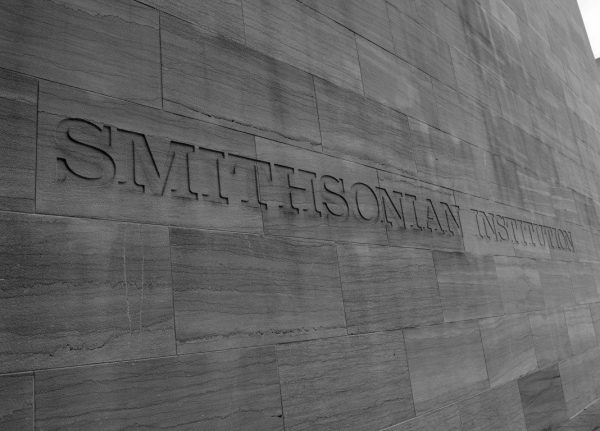 Being “One Smithsonian” is a key goal of the Smithsonian’s new strategic plan. 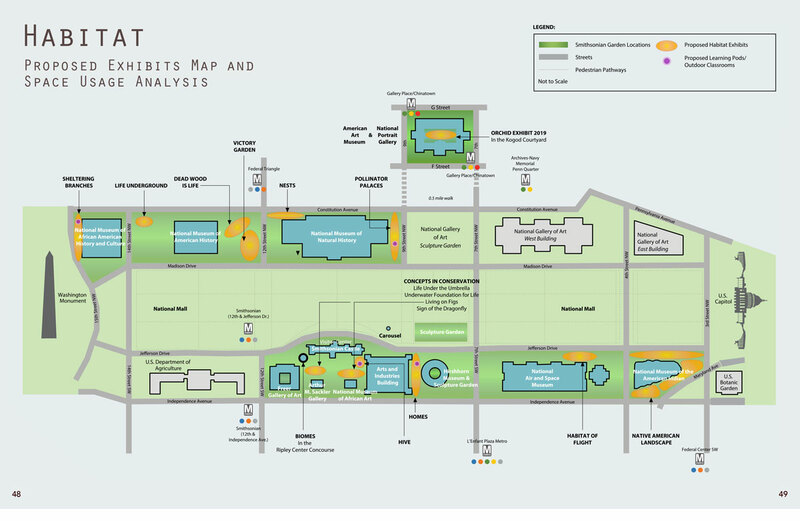 A map showing the proposed Habitat exhibits, which will be spread across the National Mall and at the Donald W. Reynolds Center for American Art and Portraiture. 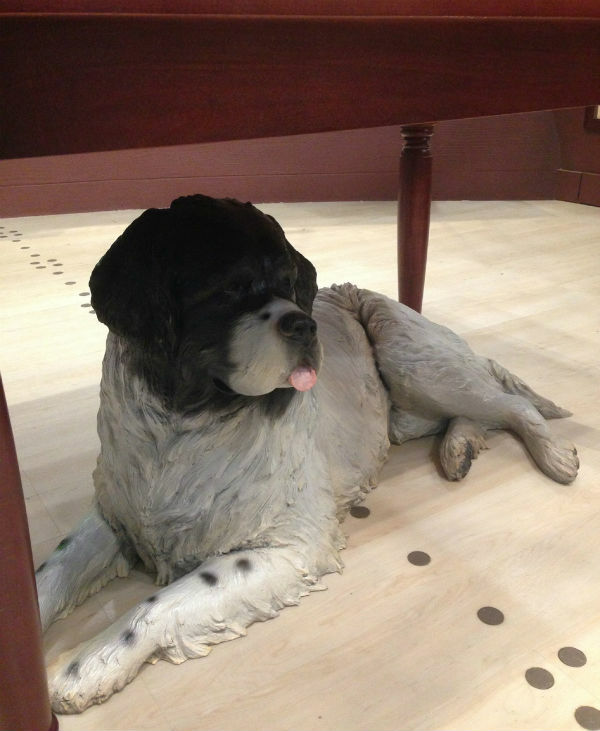 The final IMP was launched at the Smithsonian Institution Exhibits Share Fair in February. 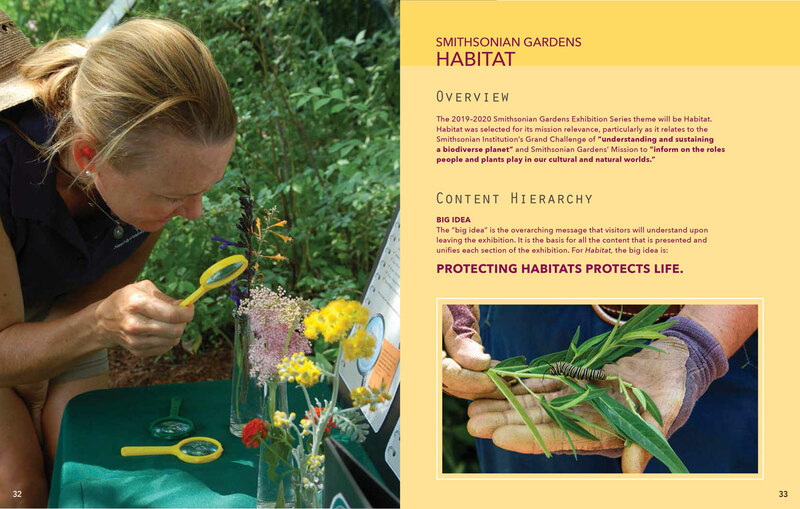 You can read the final IMP on Smithsonian Gardens’ website here. Habitat will launch in 2019 at a garden near you. In the meantime, get outside and enjoy the spring flowers! And of course, they’re right: the FBI is not the Smithsonian, but they are a federal agency, which means we are able to work on their exhibitions under certain circumstances. 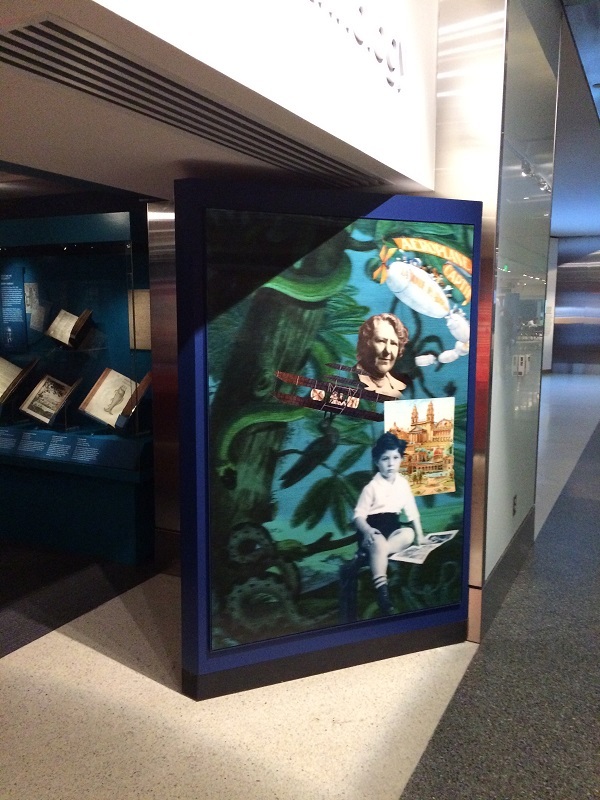 Smithsonian Exhibits’ primary focus is, obviously, the Smithsonian. Our priority is to help our museums, galleries, offices, cultural centers, libraries, and … well, you get the picture: we have a lot of moving parts, and we love to help those parts get their exhibitions up and running. We are, however, also able to partner with federal agencies if their end product is an exhibition on view to the public. This is particularly handy for agencies that want to set up exhibitions for the first time, but haven’t yet hired museum staff, or perhaps don’t plan on staffing an exhibition once it is open. Provided the work aligns with our missions and goals and we have the capacity to take on the project and a variety of financial requirements are met—I won’t bore you with those details—we can take on the project. In other words, it isn’t a common occurrence, but we do have the occasional outside exhibition. (These outside projects are managed through the Smithsonian’s Office of Sponsored Projects (OSP) through an Inter-Agency Agreement contracting protocol.) When the FBI came to us to discuss opening an exhibition to the public, we were happy to realize that their project met all of the above requirements. For years, the FBI’s iconic tour had been one of the most popular tours in Washington, D.C. After the 9/11 attacks, the FBI had to shutter the tour due to security concerns. After a lengthy hiatus from welcoming the public into Headquarters, the FBI decided to create an exhibition to explain how the FBI works today. 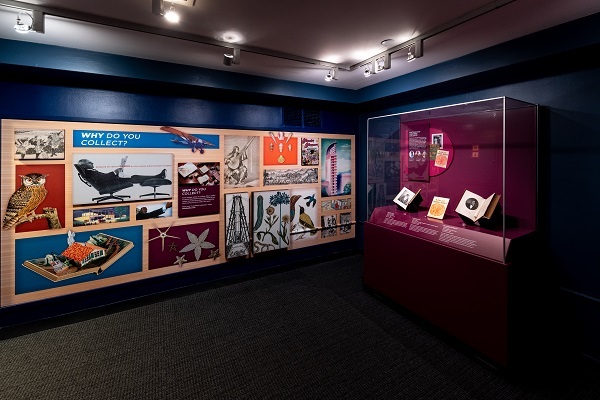 Smithsonian Exhibits was able to partner with the Bureau to create a brand-new exhibition. The FBI Experience opened in June 2017 on two floors of the Headquarters building. Infographics explain how investigations progress. Specialized equipment is on display in an area dedicated to the Hostage Rescue Team, part of the Critical Incidents Response Group. The FBI restructured after the 9/11 attacks. The newly reorganized Bureau found even greater strength through cooperation with other federal agencies and local police departments. Recently, the FBI acquired objects for use within a new section on multi-agency partnerships. This section explores some of the ways the Bureau works with other agencies and law enforcement departments. By building on each other’s strengths, the FBI, local police, and other agencies can solve crimes and take down criminal organizations more effectively. 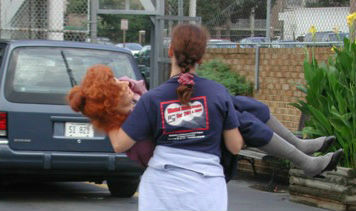 Each group brings their own expertise to the situation, and that makes a better team. Really, that’s what we’re doing with the FBI, too (albeit in a much, much less crime fight-y way). Inter-agency partnership allows for each group to bring their best parts to the process. 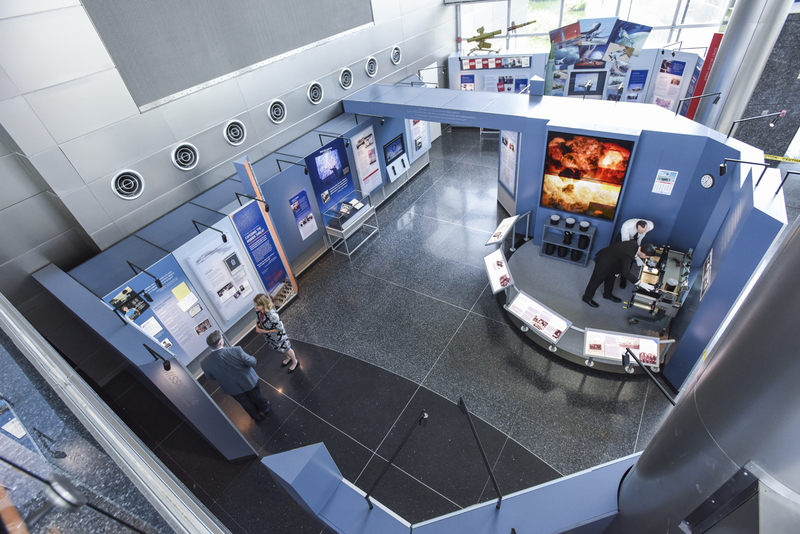 The FBI brings their practices and history; Smithsonian Exhibits provides exhibit development and design, scriptwriting, project management, custom artwork, and mount making. By working together throughout the phases of this project, we can achieve the best possible outcome. When I was just ten years old, my mother and I were admiring the beautiful dioramas at the National Museum of Natural History when she told me that I could make dioramas one day. I forgot about that until I was well out of art school and looking for work that I could enjoy doing for the rest of my life. 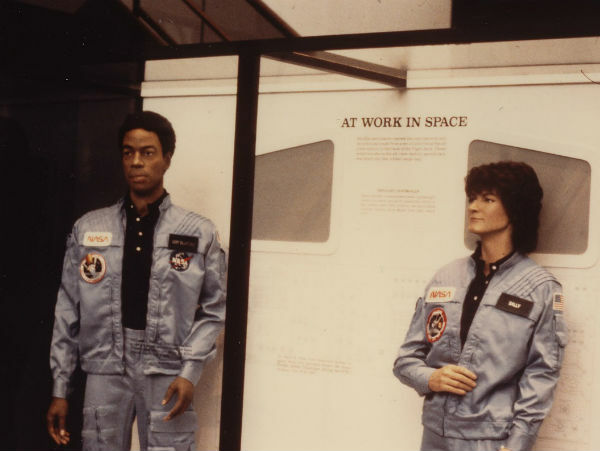 I was very, very lucky to get a job at the Smithsonian in 1981 doing exactly what I wanted: making models and dioramas! 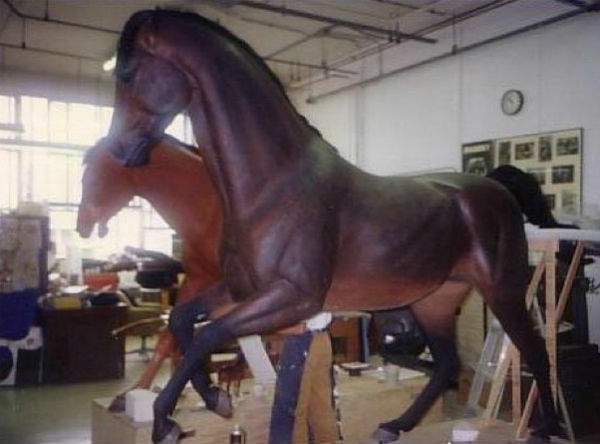 I have spent the last 36 years at Smithsonian Exhibits making mannequins and models of horses, dogs, food, plants, enlarged butterflies, and whatever else came our way. The work is messy, laborious, and time-consuming, but it’s been a blast! Along the way, I’ve learned new techniques and approaches from my talented coworkers. I’ve also collaborated with and learned from fascinating curators and scientists. No two jobs have been alike. Here are some highlights from my career. 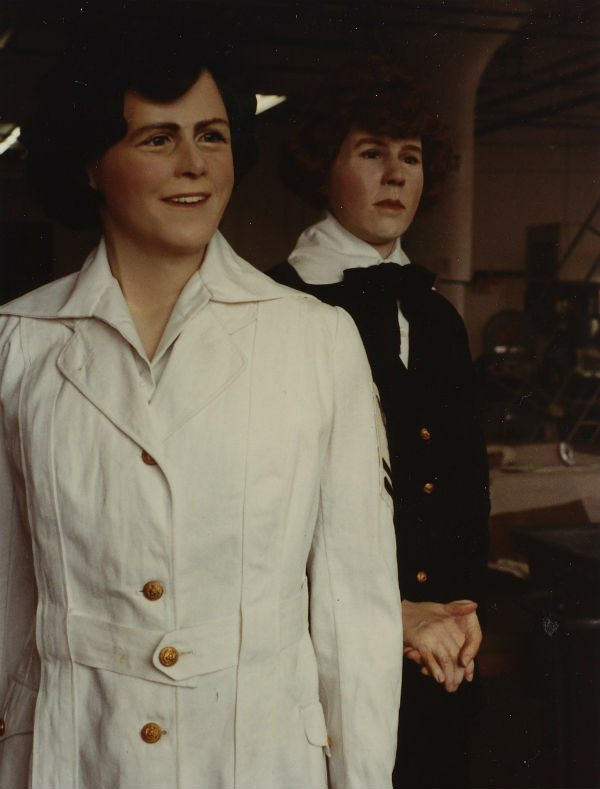 My first portrait figure was of Sally Ride, the first American woman in space. Since she was not going to come to DC for a face mask, I volunteered to sculpt her face using photos. 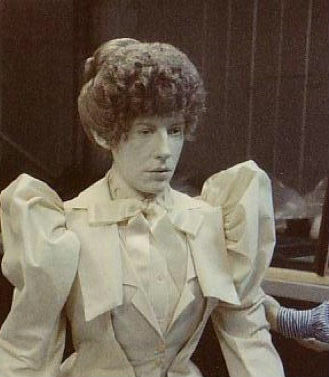 That worked well, except that all the photos were of her in outer space, so the mannequin shows what she looked like without gravity. Oh well! Guy Bluford, the first African American in space, did come to DC for me to take a face mold from him directly. What a thrill! Sculpting the entry to the Star Wars diorama for a SITES traveling exhibit using papier-mâché. 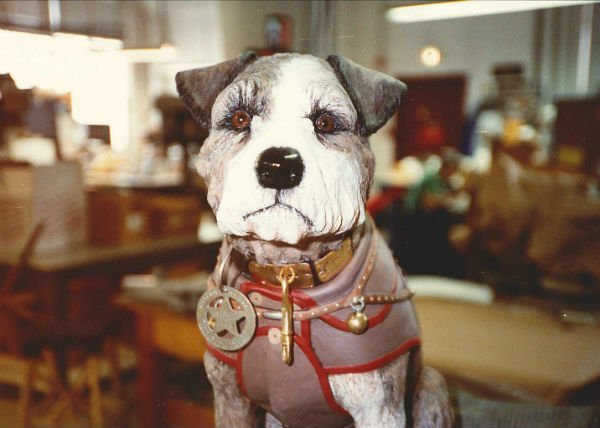 I sculpted this World War I flying ace from photos. 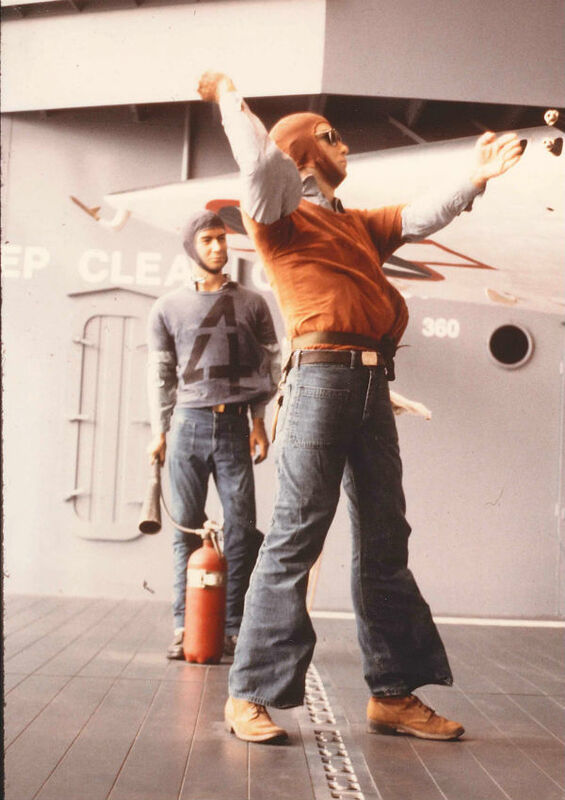 Here I am dressing a mannequin that is signaling to the pilot on an aircraft carrier. Because he had to look like he was in a high wind, I had to use a combination of glue and padding to get the windy effect. 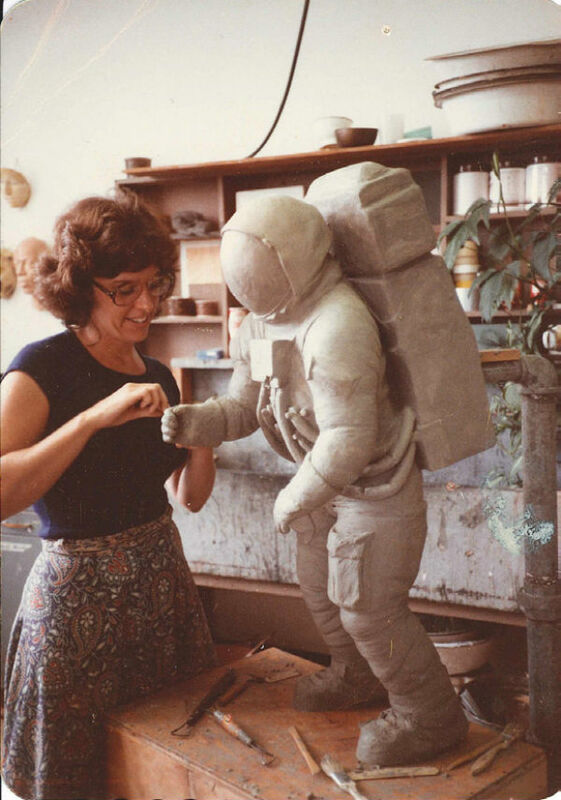 Here I am making a half-scale touchable model of astronaut Neil Armstrong on the Moon for a traveling exhibit. 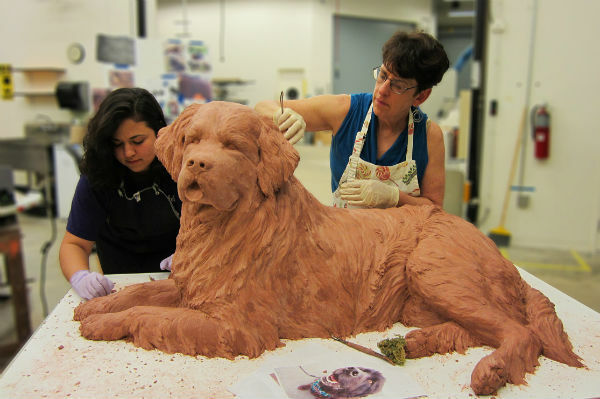 Working with coworker Megan Dattoria to finish sculpting Sidney, the Newfoundland dog on display in the Time and Navigation exhibit at NASM. Sidney is my one and only bronze model! 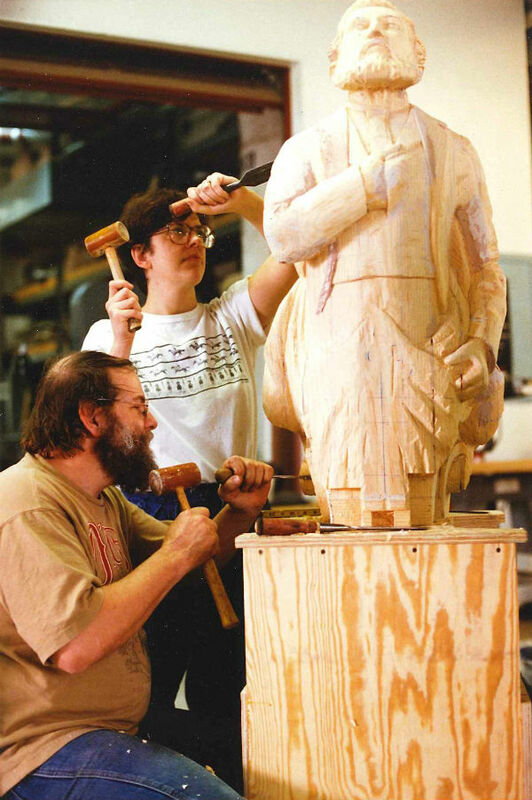 My coworker Carol Reuter and I worked with former NMAH curator Spencer Crew and designer Jim Sims on the positioning of six figures for the exhibit Field to Factory. 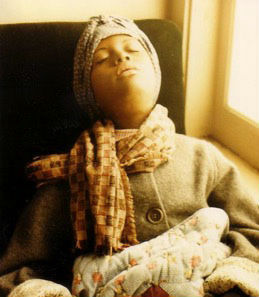 Spencer’s own family members were used as reference material. It was the first time I used glass eyes. 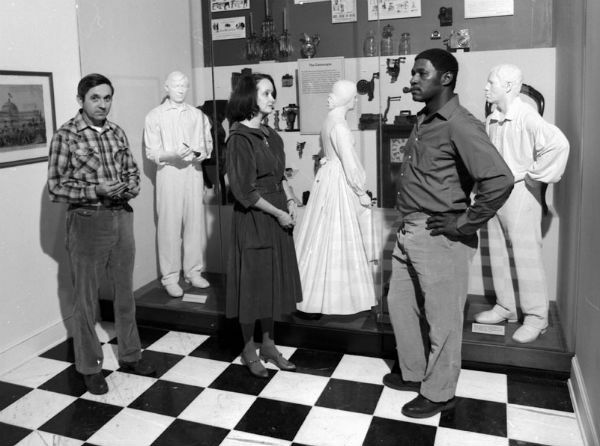 Three staffers from my office, Ben Snouffer, Rosemary Regan, and Harold Campbell, pose in front of their mannequins for the exhibit Engines of Change. 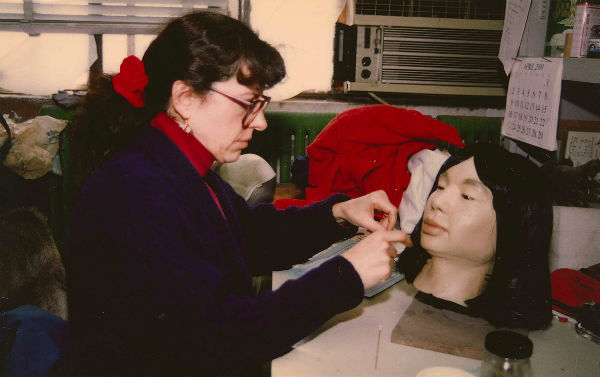 When appropriate, we took castings from actual people—faces, hands, and feet—so quite a few Smithsonian employees appear in the exhibits. I cast my own face for this nineteenth-century lady for the exhibit Parlor to Politics. 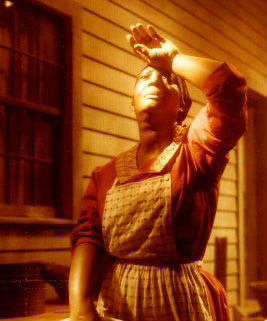 My coworker Carol Reuter sewed the muslin garment and I styled the hair. I created these two women for the Military History Hall. The lady in white has the same face as the World War I fighter pilot I had recently made for the National Air and Space Museum. 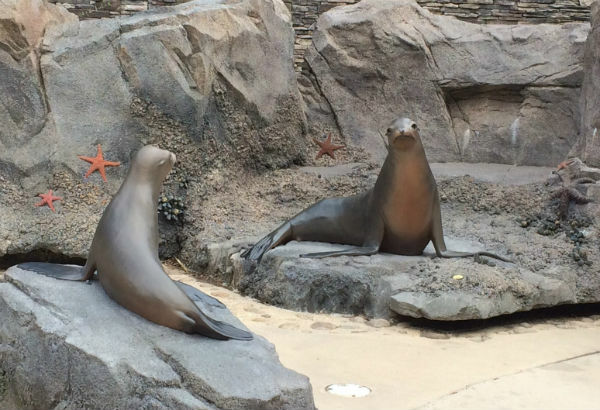 More recently, I worked with the Zoo team to make two sea lions, a mamma and her pup. No glass eyes were used here; instead, I carved into the clay to create shadows to give the effect of dimensionality in the eyes. 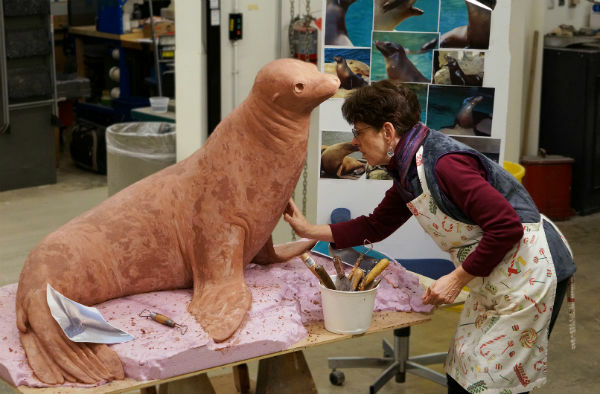 An intern worked with me to sculpt the pup, and coworker Carolyn Thome painted the sea lions. 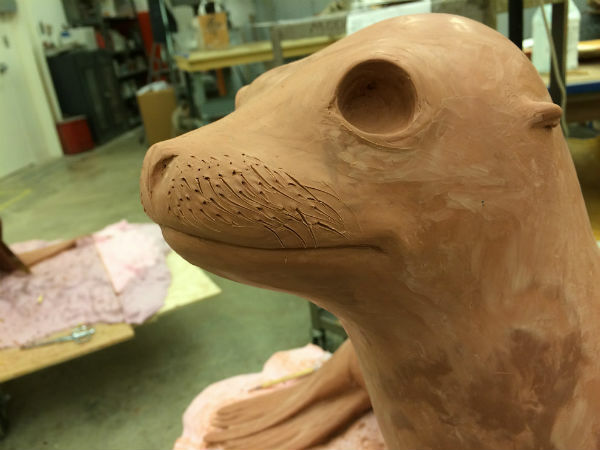 Learn more about the process I used to create the sea lions here. This is the project I am most proud of: making two of the four full-sized running horses pulling the stagecoach. Coworker Danny Fielding and I used a different approach on every horse, learning as we went along! 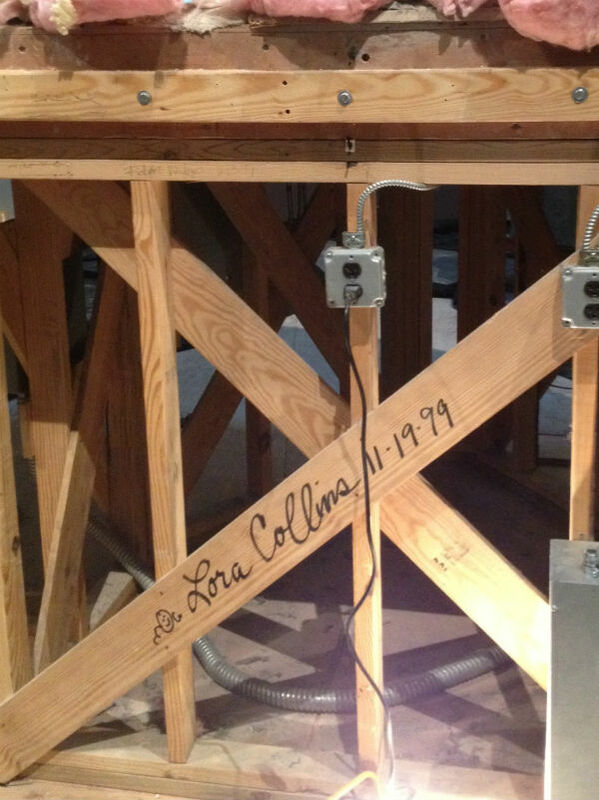 They were installed for the inaugural opening of the museum, along with several mannequins and other models from our shop, including the full-sized railcar. 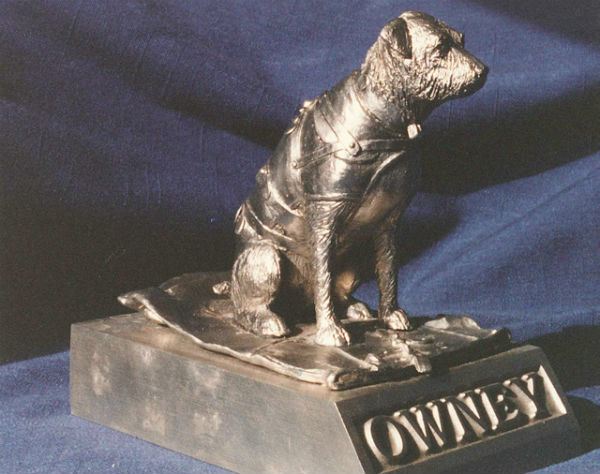 A desktop-sized version of Owney, the mascot for the U.S. Postal Service, which I sculpted first in clay and cast in metal. 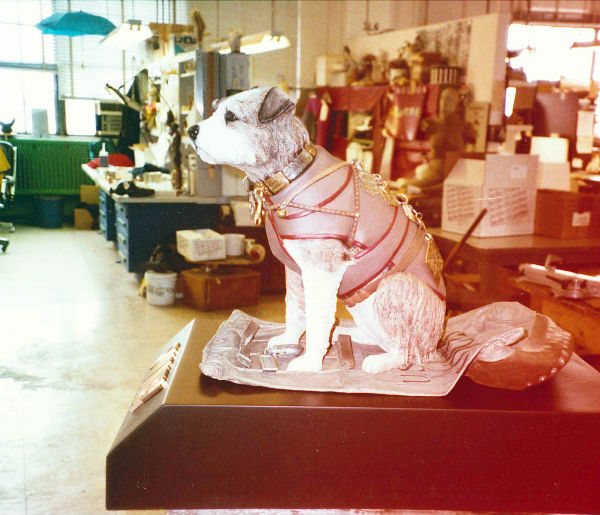 A life-sized touchable model of Owney. I sculpted everything except the badges and hardware. I molded, cast, and painted everything, including the mailbag he is sitting on. 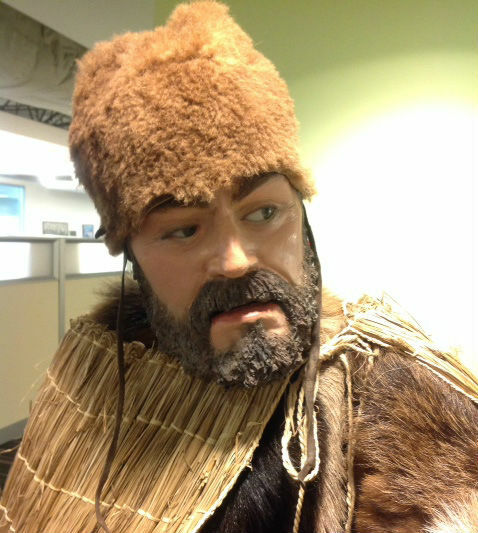 I created this head of Ötzi the Iceman working from a National Geographic photo of John Gurche’s forensic sculpture of him. 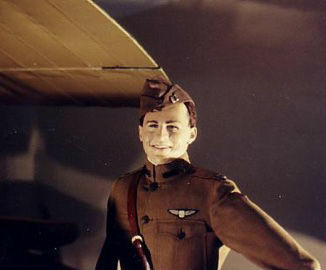 The rest of the figure and diorama were made by others. Just a few years I ago, I took a course to learn forensic reconstruction, a fascinating combination of biology and art and definitely something I want to pursue further. 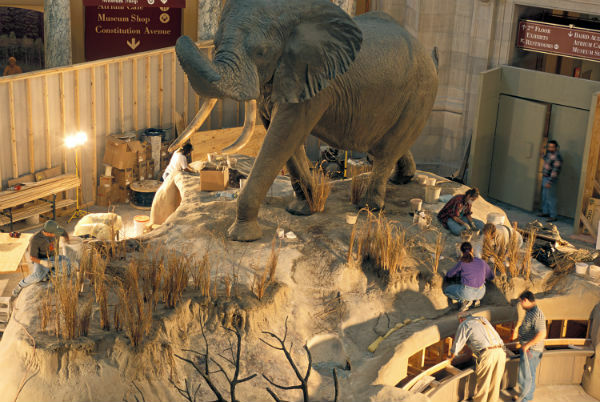 This is the huge elephant diorama project we did in 1999. I love working as part of a team. Photo by Chip Clark, Smithsonian. My “John Hancock” at the base of the elephant diorama, which was recently redone, making me feel old! Putting the finishing touches on a head for a diorama for the exhibit Vikings. 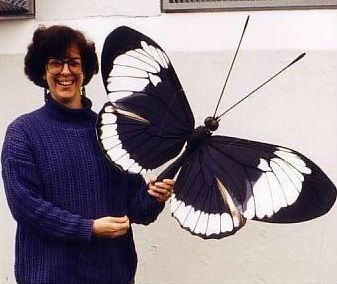 I enjoyed making larger-than-life butterflies for the Smithsonian Tropical Research Institute in Panama. I learned so much about what makes different butterfly species unique. Pygmy baby for the traveling exhibit Tropical Rainforests. Wood carving for the exhibit Going to Sea with coworker John Siske, a true collaboration. My final project at Smithsonian Exhibits is almost finished. 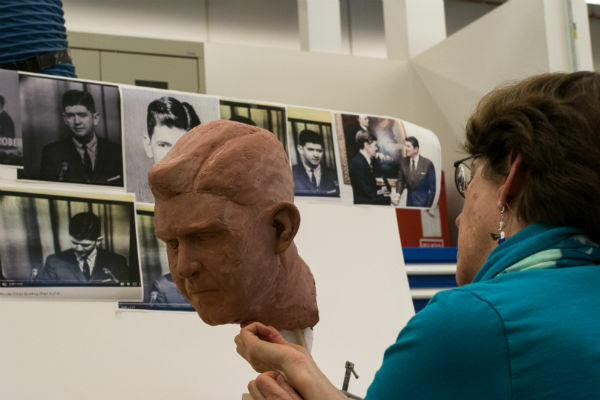 I’ve been sculpting the portrait of John T. Hughes for a diorama on the Cuban Missile Crisis that will be on display at the Defense Intelligence Agency (DIA) in the summer. Mr. Hughes played a crucial part in delivering intelligence to the President and his team during the Cuban Missile Crisis. I am looking forward to doing much more of my own art as a retiree, including oil painting, figurative sculpting, portraiture, and maybe even forensic reconstruction. We shall see!